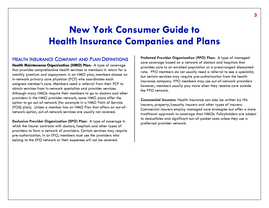 3) 2 New York Consumer Guide to Health Insurance Companies and Plans ï‚· DOH collects data through the New York State Department of Health&rsquo;s Quality Assurance Reporting Requirements (QARR) and the Consumer Assessment of Healthcare Providers and Systems (CAHPS&reg;).1 ABOUT THIS GUIDE The purpose of this Guide is to: ï‚· Inform you of the health insurance products offered in New York State and how they work. 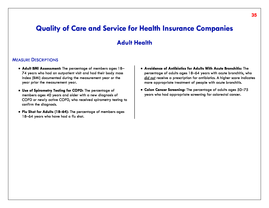 ï‚· Help you choose a health insurance company based on quality of care and service. 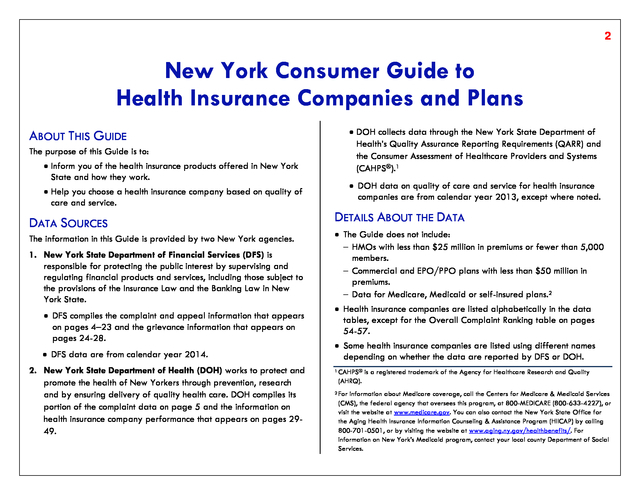 DATA SOURCES The information in this Guide is provided by two New York agencies. 1. New York State Department of Financial Services (DFS) is responsible for protecting the public interest by supervising and regulating financial products and services, including those subject to the provisions of the Insurance Law and the Banking Law in New York State. ï‚· DFS compiles the complaint and appeal information that appears on pages 4&ndash;23 and the grievance information that appears on pages 24-28. ï‚· DFS data are from calendar year 2014. 2. 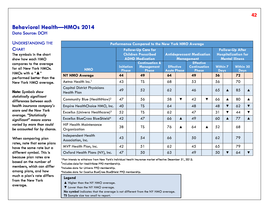 New York State Department of Health (DOH) works to protect and promote the health of New Yorkers through prevention, research and by ensuring delivery of quality health care. 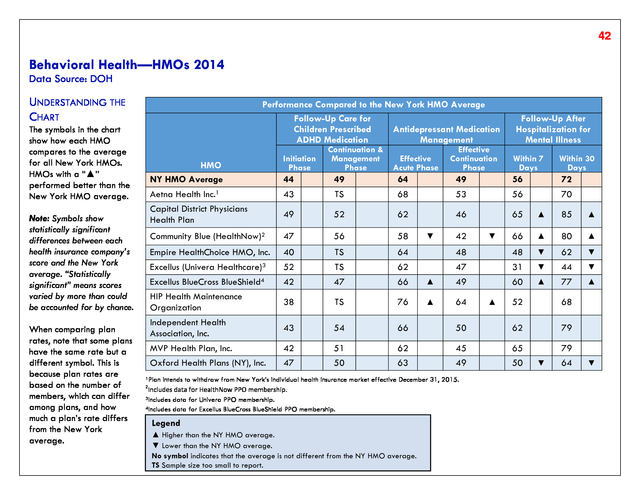 DOH compiles its portion of the complaint data on page 5 and the information on health insurance company performance that appears on pages 2949. ï‚· DOH data on quality of care and service for health insurance companies are from calendar year 2013, except where noted. 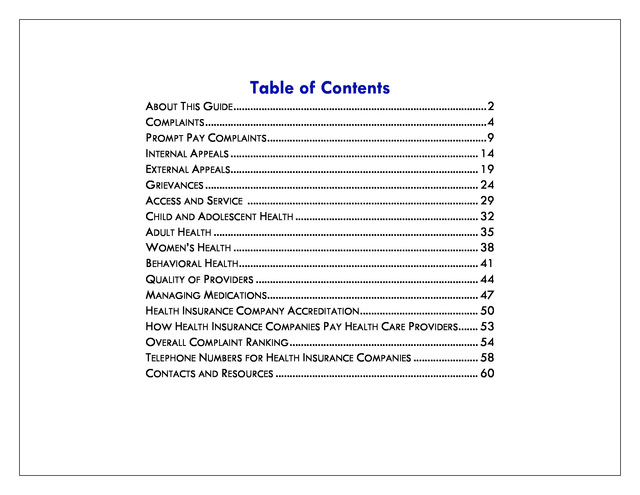 DETAILS ABOUT THE DATA ï‚· The Guide does not include: &ndash; HMOs with less than $25 million in premiums or fewer than 5,000 members. 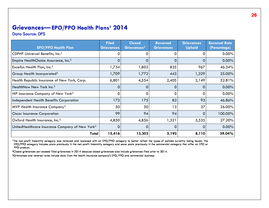 &ndash; Commercial and EPO/PPO plans with less than $50 million in premiums. 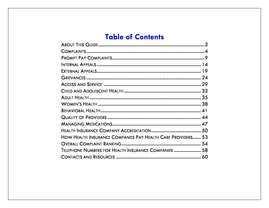 &ndash; Data for Medicare, Medicaid or self-insured plans.2 ï‚· Health insurance companies are listed alphabetically in the data tables, except for the Overall Complaint Ranking table on pages 54-57. ï‚· Some health insurance companies are listed using different names depending on whether the data are reported by DFS or DOH. 1 CAHPS&reg; is a registered trademark of the Agency for Healthcare Research and Quality (AHRQ). 2 For information about Medicare coverage, call the Centers for Medicare &amp; Medicaid Services (CMS), the federal agency that oversees this program, at 800-MEDICARE (800-633-4227), or visit the website at www.medicare.gov. 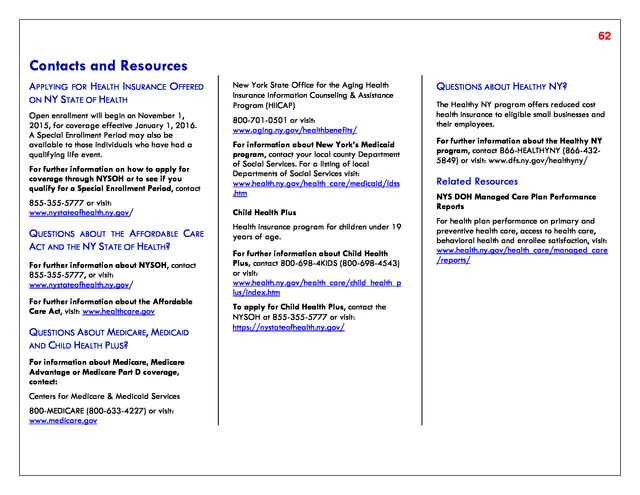 You can also contact the New York State Office for the Aging Health Insurance Information Counseling &amp; Assistance Program (HIICAP) by calling 800-701-0501, or by visiting the website at www.aging.ny.gov/healthbenefits/. 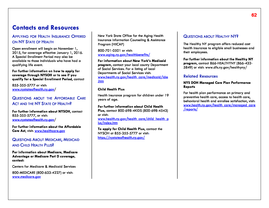 For information on New York&rsquo;s Medicaid program, contact your local county Department of Social Services. 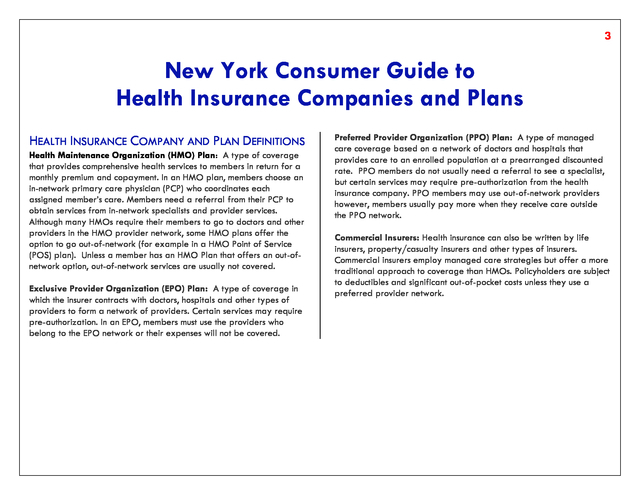 4) 3 New York Consumer Guide to Health Insurance Companies and Plans HEALTH INSURANCE COMPANY AND PLAN DEFINITIONS Health Maintenance Organization (HMO) Plan: A type of coverage that provides comprehensive health services to members in return for a monthly premium and copayment. 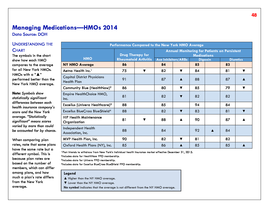 In an HMO plan, members choose an in-network primary care physician (PCP) who coordinates each assigned member&rsquo;s care. Members need a referral from their PCP to obtain services from in-network specialists and provider services. 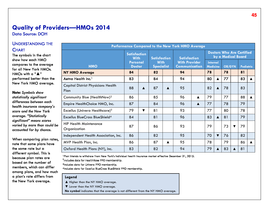 Although many HMOs require their members to go to doctors and other providers in the HMO provider network, some HMO plans offer the option to go out-of-network (for example in a HMO Point of Service (POS) plan). 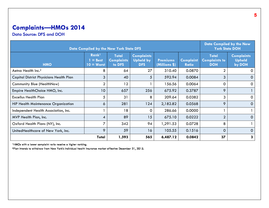 Unless a member has an HMO Plan that offers an out-ofnetwork option, out-of-network services are usually not covered. 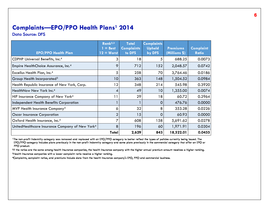 Exclusive Provider Organization (EPO) Plan: A type of coverage in which the insurer contracts with doctors, hospitals and other types of providers to form a network of providers. Certain services may require pre-authorization. In an EPO, members must use the providers who belong to the EPO network or their expenses will not be covered. 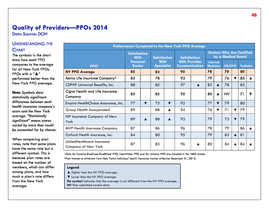 Preferred Provider Organization (PPO) Plan: A type of managed care coverage based on a network of doctors and hospitals that provides care to an enrolled population at a prearranged discounted rate. PPO members do not usually need a referral to see a specialist, but certain services may require pre-authorization from the health insurance company. 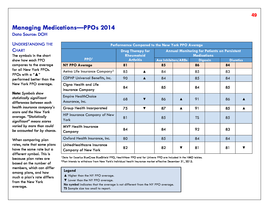 PPO members may use out-of-network providers however, members usually pay more when they receive care outside the PPO network. 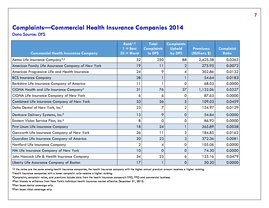 Commercial Insurers: Health insurance can also be written by life insurers, property/casualty insurers and other types of insurers. 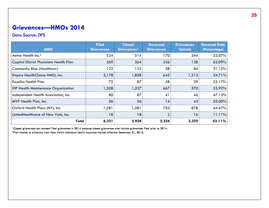 Commercial insurers employ managed care strategies but offer a more traditional approach to coverage than HMOs. Policyholders are subject to deductibles and significant out-of-pocket costs unless they use a preferred provider network. 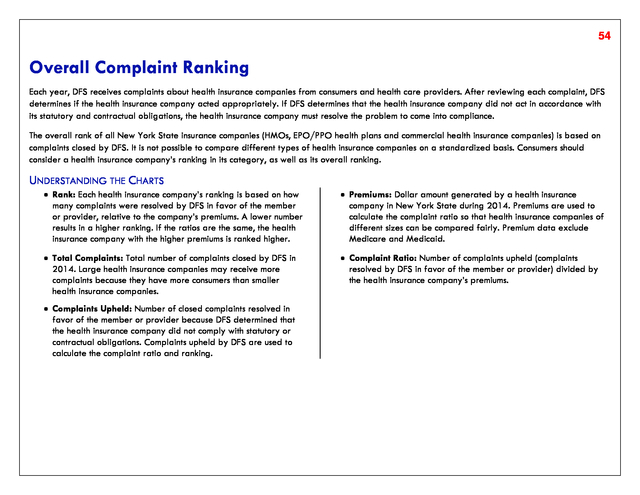 5) 4 Complaints Each year, the New York State DFS and DOH receives complaints from consumers and health care providers about health insurance companies. 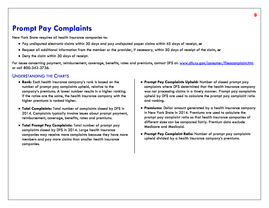 Complaints typically involve issues related to prompt payment, reimbursement, coverage, benefits, rates and premiums. After reviewing each complaint, the State determines if the health insurance company acted appropriately. If the State determines that the health insurance company did not act in accordance with its statutory and contractual obligations, the company must resolve the problem to come into compliance. 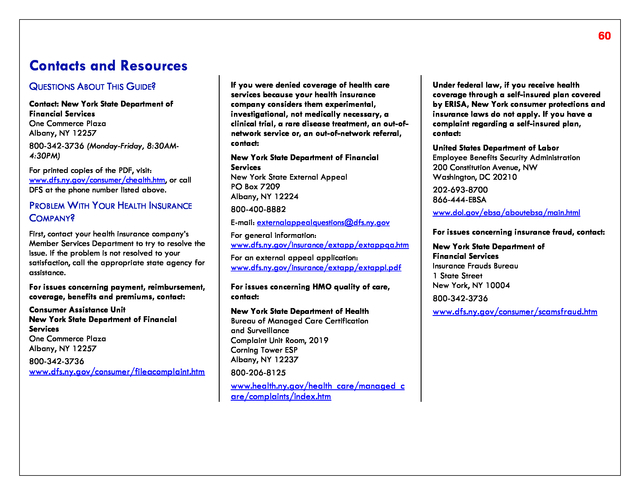 For issues concerning payment, reimbursement, coverage, benefits, rates and premiums, contact DFS at: www.dfs.ny.gov/consumer/fileacomplaint.htm or call 800-342-3736. 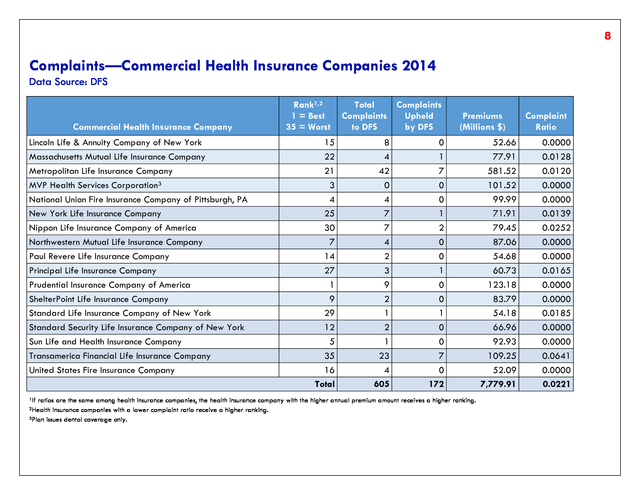 UNDERSTANDING THE CHARTS ï‚· Rank: Each health insurance company&rsquo;s rank is based on how many complaints were resolved by DFS in favor of the member or provider, relative to the company&rsquo;s premiums. A lower number results in a higher ranking. If the ratios are the same, the health insurance company with the higher premiums is ranked higher. 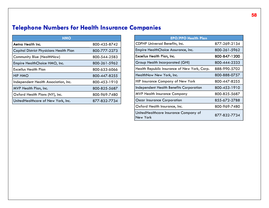 ï‚· Premiums: Dollar amount generated by a health insurance company in New York State during 2014. Premiums are used to calculate the complaint ratio so that health insurance companies of different sizes can be compared fairly. Premium data exclude Medicare and Medicaid. 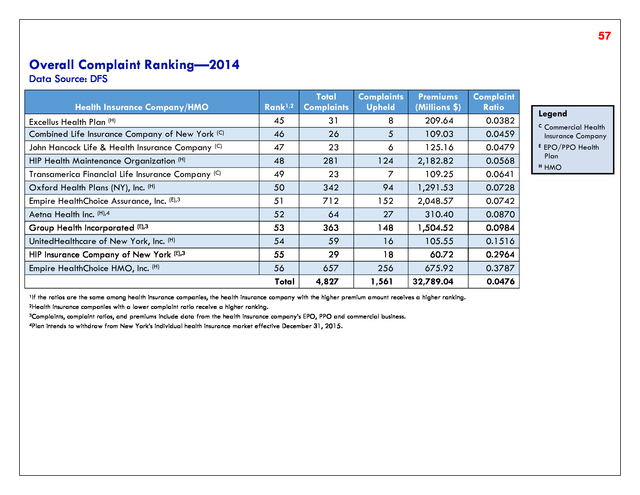 ï‚· Total Complaints to DFS: Total number of complaints closed by DFS in 2014. 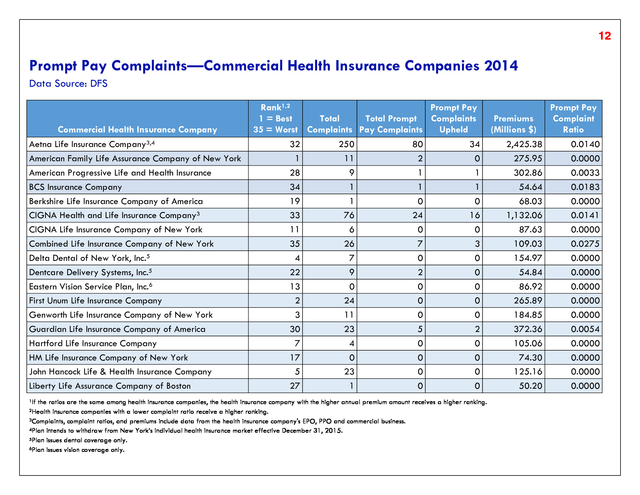 Large health insurance companies may receive more complaints because they have more members than smaller health insurance companies. 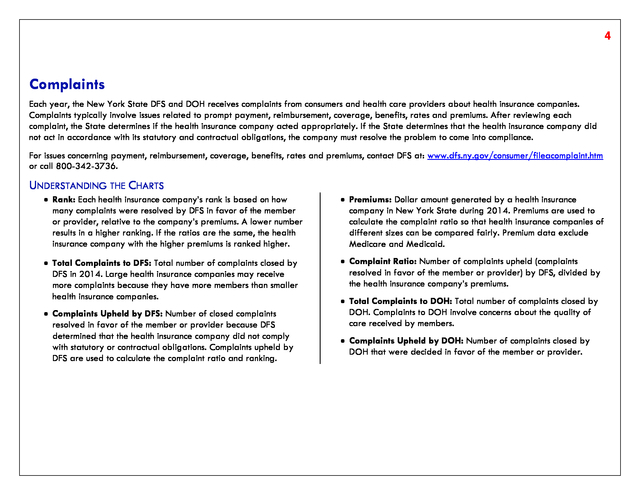 ï‚· Complaint Ratio: Number of complaints upheld (complaints resolved in favor of the member or provider) by DFS, divided by the health insurance company&rsquo;s premiums. ï‚· Complaints Upheld by DFS: Number of closed complaints resolved in favor of the member or provider because DFS determined that the health insurance company did not comply with statutory or contractual obligations. Complaints upheld by DFS are used to calculate the complaint ratio and ranking. ï‚· Total Complaints to DOH: Total number of complaints closed by DOH. Complaints to DOH involve concerns about the quality of care received by members. 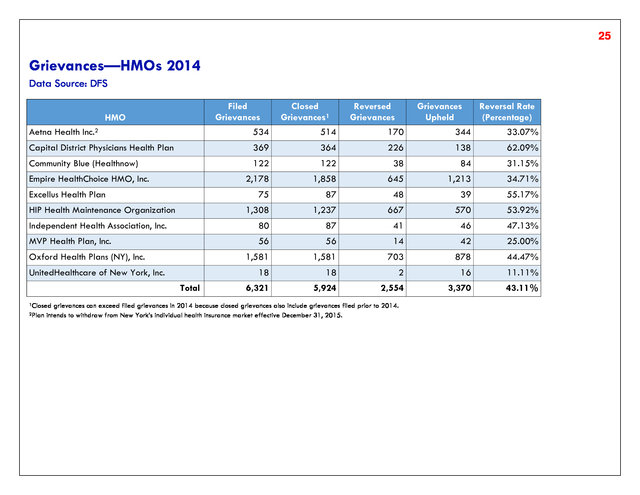 ï‚· Complaints Upheld by DOH: Number of complaints closed by DOH that were decided in favor of the member or provider. 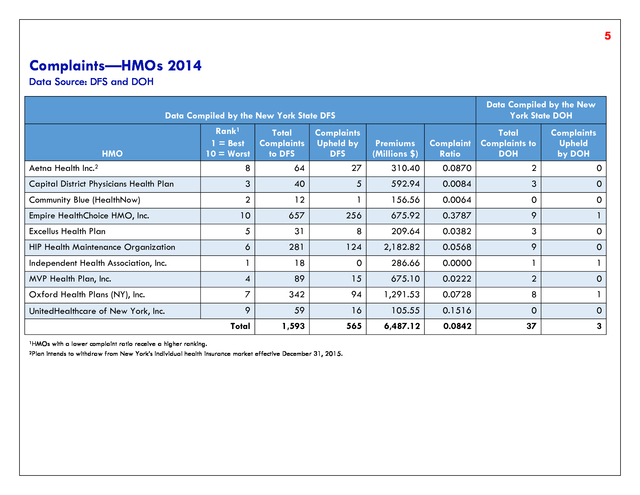 6) 5 Complaints&mdash;HMOs 2014 Data Source: DFS and DOH Data Compiled by the New York State DOH Data Compiled by the New York State DFS HMO Aetna Health Inc.2 Rank1 Total 1 = Best Complaints 10 = Worst to DFS 8 64 Complaints Upheld by DFS 27 Total Premiums Complaint Complaints to (Millions $) Ratio DOH 310.40 0.0870 2 Complaints Upheld by DOH 0 Capital District Physicians Health Plan 3 40 5 592.94 0.0084 3 0 Community Blue (HealthNow) 2 12 1 156.56 0.0064 0 0 10 657 256 675.92 0.3787 9 1 Excellus Health Plan 5 31 8 209.64 0.0382 3 0 HIP Health Maintenance Organization 6 281 124 2,182.82 0.0568 9 0 Independent Health Association, Inc. 1 18 0 286.66 0.0000 1 1 MVP Health Plan, Inc. 4 89 15 675.10 0.0222 2 0 Oxford Health Plans (NY), Inc. 7 342 94 1,291.53 0.0728 8 1 UnitedHealthcare of New York, Inc. 9 59 16 105.55 0.1516 0 0 Total 1,593 565 6,487.12 0.0842 37 3 Empire HealthChoice HMO, Inc. 1HMOs 2Plan with a lower complaint ratio receive a higher ranking. 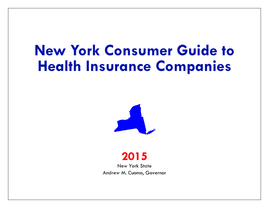 intends to withdraw from New York&rsquo;s individual health insurance market effective December 31, 2015. 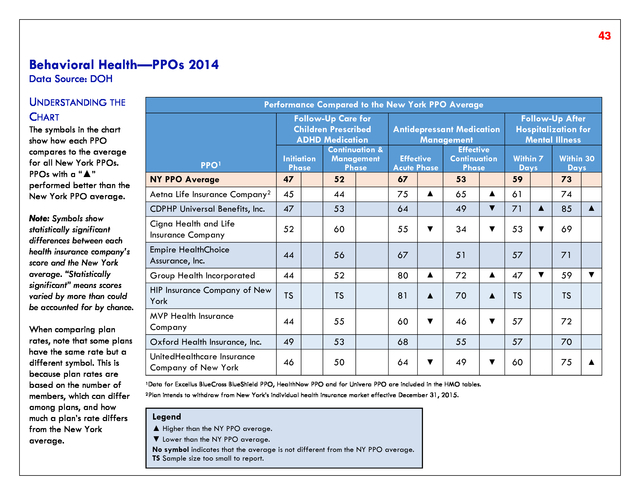 7) 6 Complaints&mdash;EPO/PPO Health Plans1 2014 Data Source: DFS EPO/PPO Health Plan Rank2,3 Total Complaints Premiums 1 = Best Complaints Upheld 12 = Worst to DFS by DFS (Millions $) Complaint Ratio CDPHP Universal Benefits, Inc.4 3 18 5 688.25 0.0073 Empire HealthChoice Assurance, Inc.4 9 712 152 2,048.57 0.0742 5 10 12 4 11 1 6 2 7 8 Total 258 363 348 49 29 1 32 15 608 196 2,629 70 148 214 10 18 0 8 0 158 60 843 3,764.46 1,504.52 545.98 1,355.00 60.72 476.76 353.28 60.93 5,691.62 1,971.91 18,522.01 0.0186 0.0984 0.3920 0.0074 0.2964 0.0000 0.0226 0.0000 0.0278 0.0304 0.0455 Excellus Health Plan, Inc.4 Group Health Incorporated3 Health Republic Insurance of New York, Corp. HealthNow New York Inc.4 HIP Insurance Company of New York4 Independent Health Benefits Corporation MVP Health Insurance Company4 Oscar Insurance Corporation Oxford Health Insurance, Inc.4 UnitedHealthcare Insurance Company of New York4 1The non-profit indemnity category was removed and replaced with an EPO/PPO category to better reflect the types of policies currently being issued. The EPO/PPO category includes plans previously in the non-profit indemnity category and some plans previously in the commercial category that offer an EPO or PPO product. 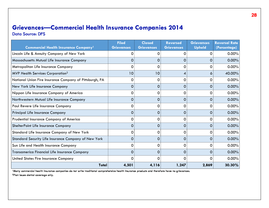 2If the ratios are the same among health insurance companies, the health insurance company with the higher annual premium amount receives a higher ranking. 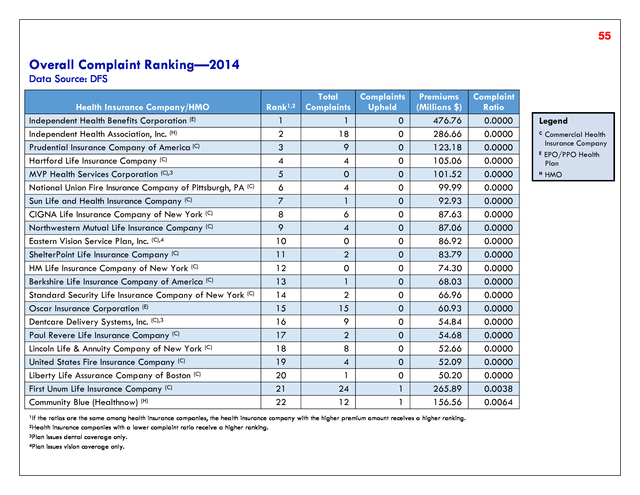 3Health insurance companies with a lower complaint ratio receive a higher ranking. 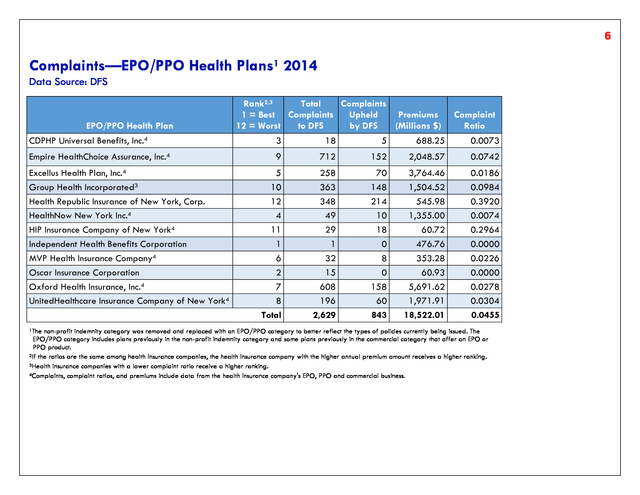 4Complaints, complaint ratios, and premiums include data from the health insurance company's EPO, PPO and commercial business. 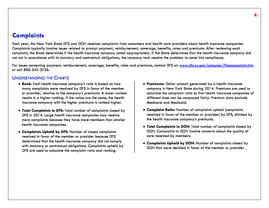 10) 9 Prompt Pay Complaints New York State requires all health insurance companies to: ï‚· Pay undisputed electronic claims within 30 days and pay undisputed paper claims within 45 days of receipt, or ï‚· Request all additional information from the member or the provider, if necessary, within 30 days of receipt of the claim, or ï‚· Deny the claim within 30 days of receipt. 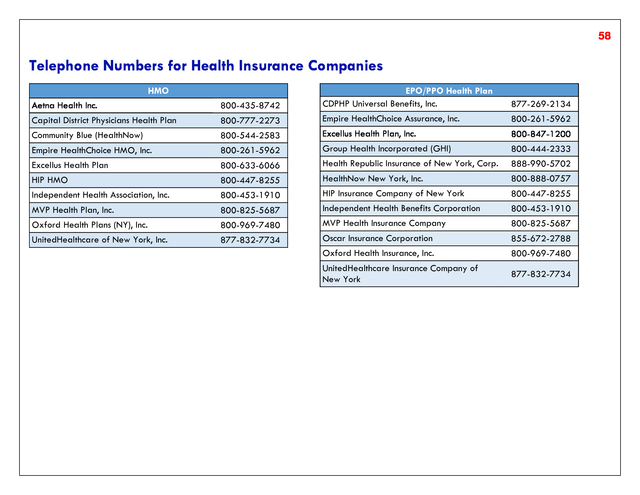 For issues concerning payment, reimbursement, coverage, benefits, rates and premiums, contact DFS at: www.dfs.ny.gov/consumer/fileacomplaint.htm or call 800-342-3736. 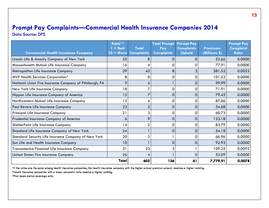 UNDERSTANDING THE CHARTS ï‚· Rank: Each health insurance company&rsquo;s rank is based on the number of prompt pay complaints upheld, relative to the company&rsquo;s premiums. A lower number results in a higher ranking. 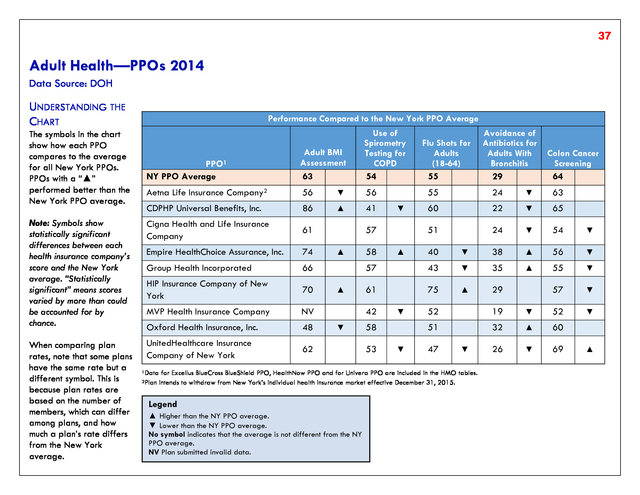 If the ratios are the same, the health insurance company with the higher premiums is ranked higher. 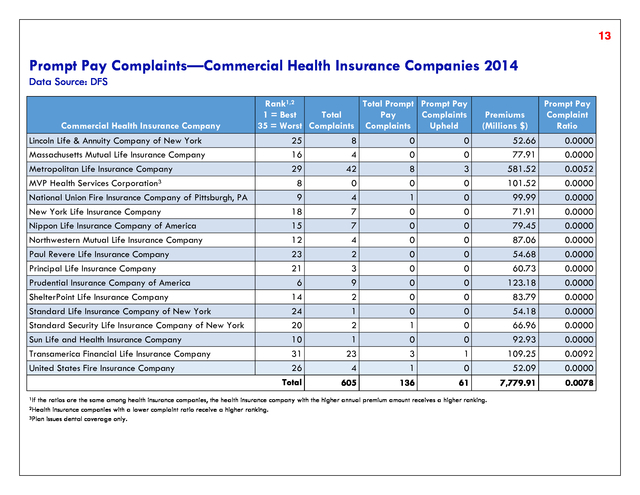 ï‚· Prompt Pay Complaints Upheld: Number of closed prompt pay complaints where DFS determined that the health insurance company was not processing claims in a timely manner. 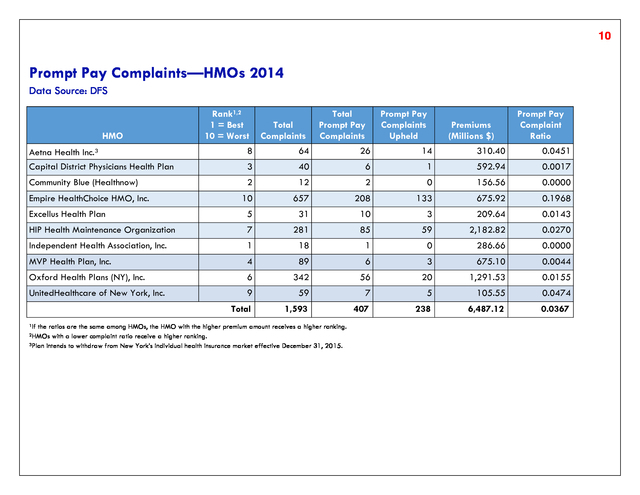 Prompt pay complaints upheld by DFS are used to calculate the prompt pay complaint ratio and ranking. ï‚· Total Complaints: Total number of complaints closed by DFS in 2014. 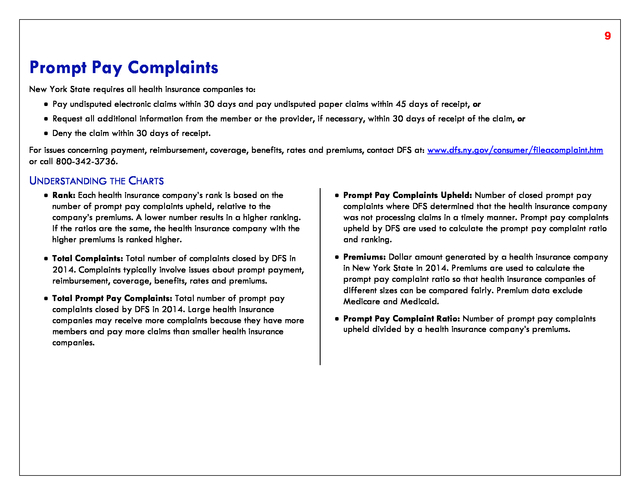 Complaints typically involve issues about prompt payment, reimbursement, coverage, benefits, rates and premiums. 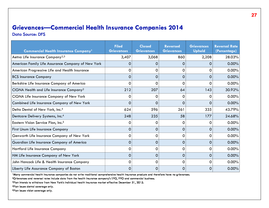 ï‚· Premiums: Dollar amount generated by a health insurance company in New York State in 2014. Premiums are used to calculate the prompt pay complaint ratio so that health insurance companies of different sizes can be compared fairly. Premium data exclude Medicare and Medicaid. 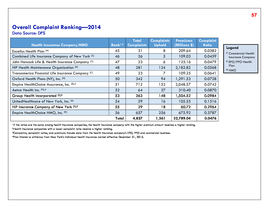 ï‚· Total Prompt Pay Complaints: Total number of prompt pay complaints closed by DFS in 2014. 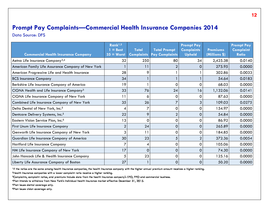 Large health insurance companies may receive more complaints because they have more members and pay more claims than smaller health insurance companies. 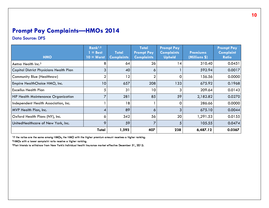 ï‚· Prompt Pay Complaint Ratio: Number of prompt pay complaints upheld divided by a health insurance company&rsquo;s premiums. 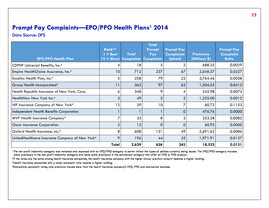 12) 11 Prompt Pay Complaints&mdash;EPO/PPO Health Plans1 2014 Data Source: DFS Total Prompt Prompt Pay Total 1 = Best Pay Complaints 12 = Worst Complaints Complaints Upheld Rank2,3 EPO/PPO Health Plan Premiums (Millions $) Prompt Pay Complaint Ratio 4 18 5 2 688.25 0.0029 10 712 237 67 2,048.57 0.0327 5 258 79 22 3,764.46 0.0058 11 363 97 62 1,504.52 0.0412 Health Republic Insurance of New York, Corp. 6 348 9 4 545.98 0.0073 HealthNow New York Inc.4 3 49 5 2 1,355.00 0.0015 12 29 10 7 60.72 0.1153 Independent Health Benefits Corporation 1 1 1 0 476.76 0.0000 MVP Health Insurance Company4 7 32 8 3 353.28 0.0085 Oscar Insurance Corporation 2 15 0 0 60.93 0.0000 Oxford Health Insurance, Inc.4 8 608 131 49 5,691.62 0.0086 UnitedHealthcare Insurance Company of New York4 9 196 44 25 1,971.91 0.0127 Total 2,629 626 243 18,522 0.0131 CDPHP Universal Benefits, Inc.4 Empire HealthChoice Assurance, Inc.4 Excellus Health Plan, Inc.4 Group Health Incorporated4 HIP Insurance Company of New York4 1The non-profit indemnity category was removed and replaced with an EPO/PPO category to better reflect the types of policies currently being issued. The EPO/PPO category includes plans previously in the non-profit indemnity category and some plans previously in the commercial category that offer an EPO or PPO product. 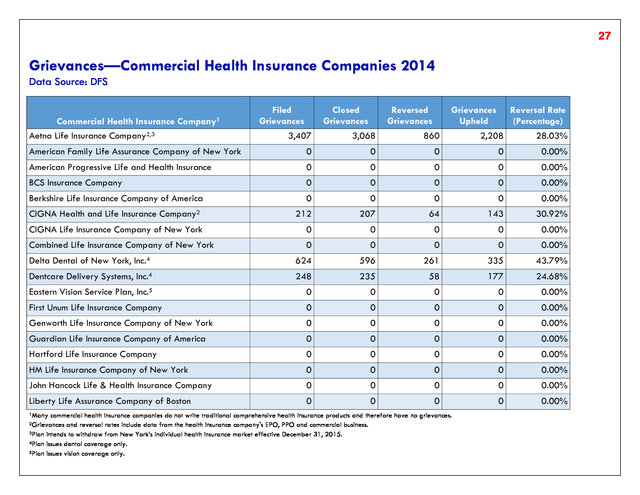 2If the ratios are the same among health insurance companies, the health insurance company with the higher annual premium amount receives a higher ranking. 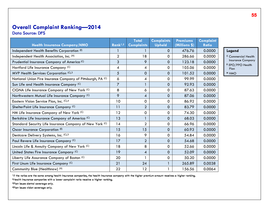 3Health insurance companies with a lower complaint ratio receive a higher ranking. 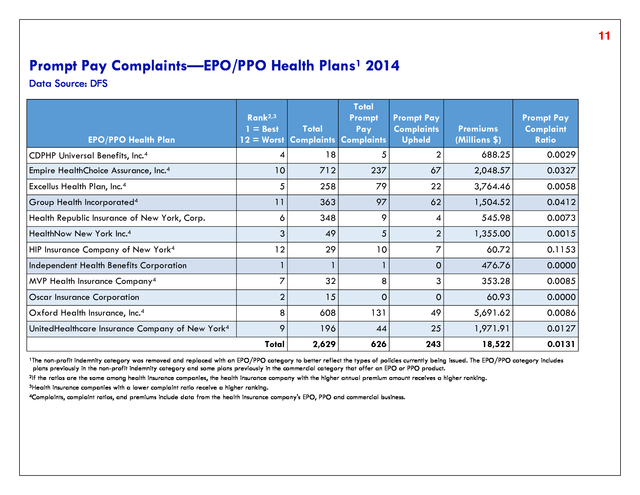 4Complaints, complaint ratios, and premiums include data from the health insurance company's EPO, PPO and commercial business. 15) 14 Internal Appeals An internal appeal or utilization review (UR) occurs when a member or provider asks a health insurance company to reconsider its refusal to pay for a medical service that the health insurance company considers experimental, investigational, not medically necessary, a clinical trial, or a treatment for a rare disease. 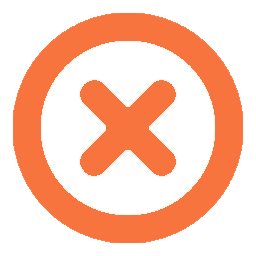 If you are an HMO member, you may also appeal when the HMO denies a request to pay for an out-of-network service1 if the HMO offers an alternate service in-network. The right to appeal an out-of-network service denial is being expanded to other insurance policies on each policy&rsquo;s renewal date on or after March 31, 2015. This appeal right will apply to out-of-network service denials issued on or after the insurance policy&rsquo;s renewal date. 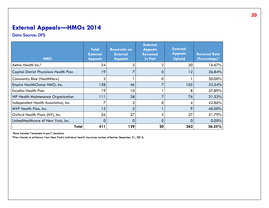 Additionally, members have the right to appeal an out-of-network referral2 denial issued on or after March 31, 2015 for HMO and Managed Care policies. For other policies, the right to appeal an out-of-network referral denial will be made available on each policy&rsquo;s renewal date on or after March 31, 2015. 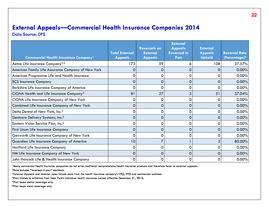 Health insurance companies are required to have appeals reviewed by medical professionals. 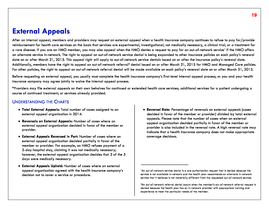 Common internal appeals involve the medical necessity of hospital admissions, length of hospital stays and use of certain medical procedures. 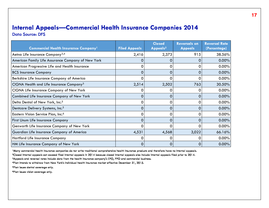 UNDERSTANDING THE CHARTS ï‚· Filed Appeals: Number of internal appeals submitted to the health insurance company by members or providers in 2014. ï‚· Closed Appeals: Number of internal appeals that the health insurance company decided by the end of 2014. KEEP IN MIND A health insurance consumer should pay specific attention to a health insurance company that has a very high or very low reversal rate. Please note: ï‚· There is no &ldquo;ideal&rdquo; reversal rate. 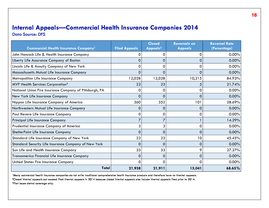 ï‚· Reversals on Appeals: Number of closed internal appeals where the health insurance company decided in favor of members or providers. 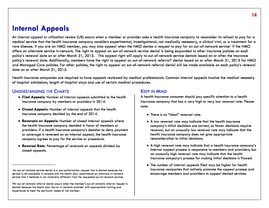 If a health insurance company&rsquo;s decision to deny payment or coverage is reversed on an internal appeal, the health insurance company agrees to pay for the service or procedure. ï‚· A low reversal rate may indicate that the health insurance company&rsquo;s initial decisions are correct, so fewer decisions require reversal, but an unusually low reversal rate may indicate that the health insurance company does not give appropriate reconsideration to initial decisions. 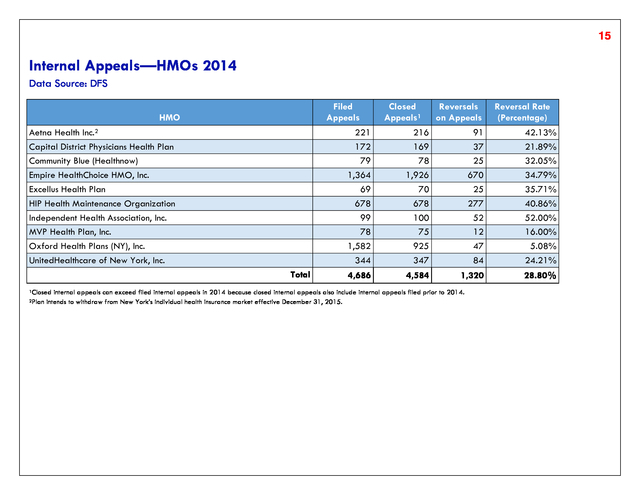 ï‚· Reversal Rate: Percentage of reversals on appeals divided by closed appeals. 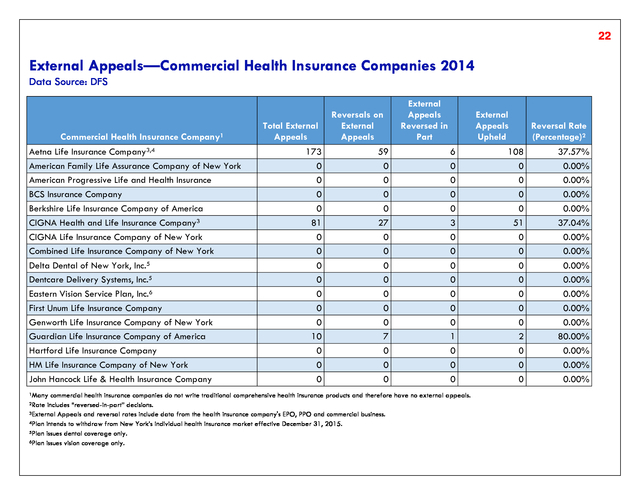 ï‚· A high reversal rate may indicate that a health insurance company&rsquo;s internal appeal process is responsive to members and providers, but an unusually high reversal rate may indicate that the health insurance company&rsquo;s process for making initial decisions is flawed. _______________________ 1An out-of-network service denial is a pre-authorization request that is denied because the service is not available in-network and the health plan recommends an alternate in-network service that it believes is not materially different from the requested out-of-network service. 2An out-of-network referral denial occurs when the member&rsquo;s out-of-network referral request is denied because the health plan has an in-network provider with appropriate training and experience to meet the particular needs of the member. 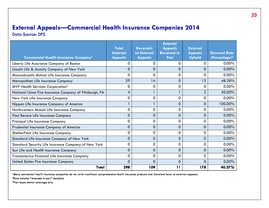 ï‚· The number of internal appeals filed may be higher for health insurance companies that actively promote the appeal process and encourage members and providers to appeal denied services. 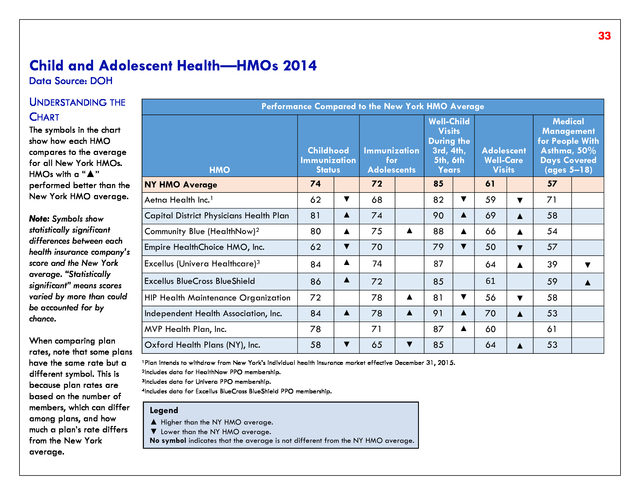 16) 15 Internal Appeals&mdash;HMOs 2014 Data Source: DFS Filed Appeals HMO Aetna Health Inc.2 Capital District Physicians Health Plan Community Blue (Healthnow) Empire HealthChoice HMO, Inc. Excellus Health Plan HIP Health Maintenance Organization Independent Health Association, Inc. MVP Health Plan, Inc. Oxford Health Plans (NY), Inc. UnitedHealthcare of New York, Inc. 2Plan Reversals on Appeals Reversal Rate (Percentage) 221 172 79 1,364 69 678 99 78 1,582 344 Total 1Closed Closed Appeals1 216 169 78 1,926 70 678 100 75 925 347 91 37 25 670 25 277 52 12 47 84 42.13% 21.89% 32.05% 34.79% 35.71% 40.86% 52.00% 16.00% 5.08% 24.21% 4,686 4,584 1,320 28.80% internal appeals can exceed filed internal appeals in 2014 because closed internal appeals also include internal appeals filed prior to 2014. intends to withdraw from New York&rsquo;s individual health insurance market effective December 31, 2015. 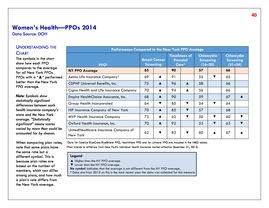 17) 16 Internal Appeals&mdash;EPO/PPO Health Plans1 2014 Data Source: DFS EPO/PPO Health Plan CDPHP Universal Benefits, Inc.3 Empire HealthChoice Assurance, Inc.3 Excellus Health Plan, Inc.3 Group Health Incorporated3 Health Republic Insurance of New York, Corp. HealthNow New York Inc.3 HIP Insurance Company of New York3 Independent Health Benefits Corporation MVP Health Insurance Company3 Oscar Insurance Corporation Oxford Health Insurance, Inc.3 UnitedHealthcare Insurance Company of New York3 Total 1The Filed Appeals Closed Appeals2 Reversals on Appeals Reversal Rate (Percentage) 524 4,525 2,654 1,395 211 481 0 186 462 4,780 2,689 1,343 211 474 0 184 263 1,666 959 519 73 160 0 109 56.93% 34.85% 35.66% 38.64% 34.60% 33.76% 0.00% 59.24% 47 47 9 19.15% 211 4,511 3,908 209 4,511 3,908 134 2,131 1,411 64.11% 47.24% 36.11% 18,653 18,818 7,434 39.50% non-profit indemnity category was removed and replaced with an EPO/PPO category to better reflect the types of policies currently being issued. The EPO/PPO category includes plans previously in the non-profit indemnity category and some plans previously in the commercial category that offer an EPO or PPO product. 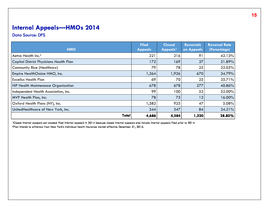 2Closed internal appeals can exceed filed internal appeals in 2014 because closed internal appeals also include internal appeals filed prior to 2014. 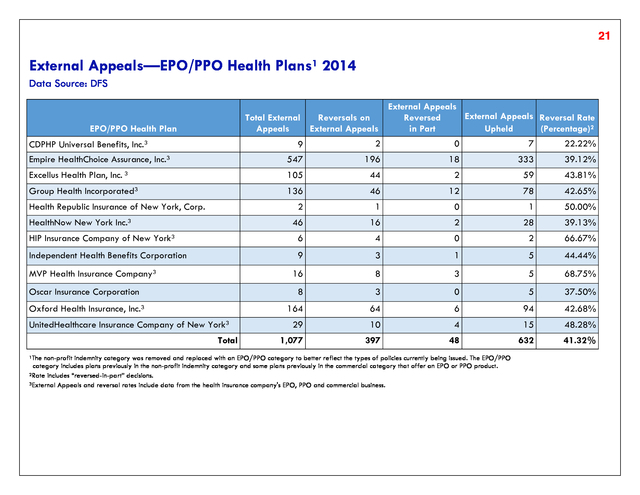 3Appeals and reversal rates include data from the health insurance company's EPO, PPO and commercial business. 20) 19 External Appeals After an internal appeal, members and providers may request an external appeal when a health insurance company continues to refuse to pay for/provide reimbursement for health care services on the basis that services are experimental, investigational, not medically necessary, a clinical trial, or a treatment for a rare disease. If you are an HMO member, you may also appeal when the HMO denies a request to pay for an out-of-network service1 if the HMO offers an alternate service in-network. The right to appeal an out-of-network service denial is being expanded to other insurance policies on each policy&rsquo;s renewal date on or after March 31, 2015. This appeal right will apply to out-of-network service denials issued on or after the insurance policy&rsquo;s renewal date. Additionally, members have the right to appeal an out-of-network referral2 denial issued on or after March 31, 2015 for HMO and Managed Care policies. For other policies, the right to appeal an out-of-network referral denial will be made available on each policy&rsquo;s renewal date on or after March 31, 2015. 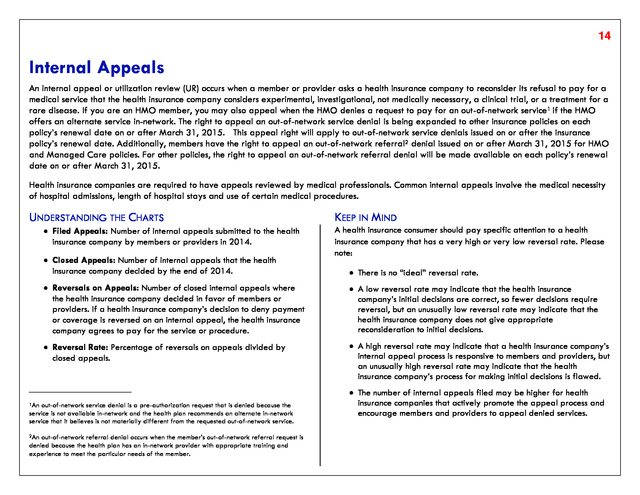 Before requesting an external appeal, you usually must complete the health insurance company&rsquo;s first-level internal appeal process, or you and your health insurance company may agree jointly to waive the internal appeal process. *Providers may file external appeals on their own behalves for continued or extended health care services; additional services for a patient undergoing a course of continued treatment; or services already provided. UNDERSTANDING THE CHARTS ï‚· Total External Appeals: Total number of cases assigned to an external appeal organization in 2014. ï‚· Reversals on External Appeals: Number of cases where an external appeal organization decided in favor of the member or provider. ï‚· External Appeals Reversed in Part: Number of cases where an external appeal organization decided partially in favor of the member or provider. 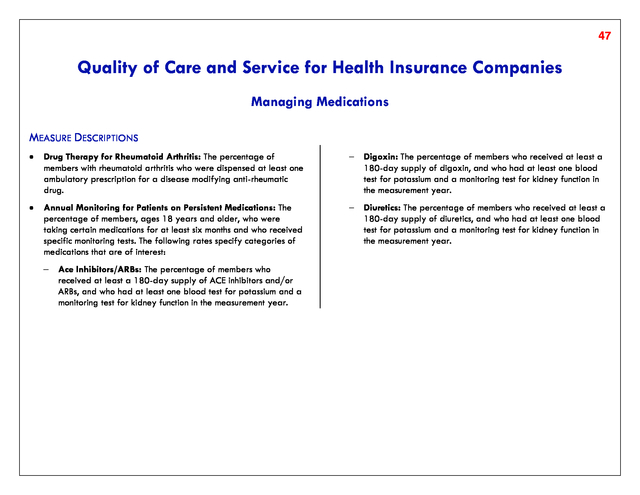 For example, an HMO refuses payment of a 5-day hospital stay, claiming it was not medically necessary; however, the external appeal organization decides that 3 of the 5 days were medically necessary. 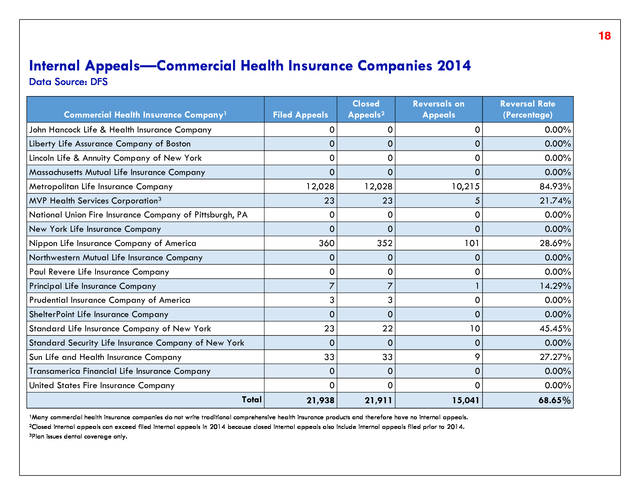 ï‚· External Appeals Upheld: Number of cases where an external appeal organization agreed with the health insurance company&rsquo;s decision not to cover a service or procedure. ï‚· Reversal Rate: Percentage of reversals on external appeals (cases decided in favor of the member or provider) divided by total external appeals. 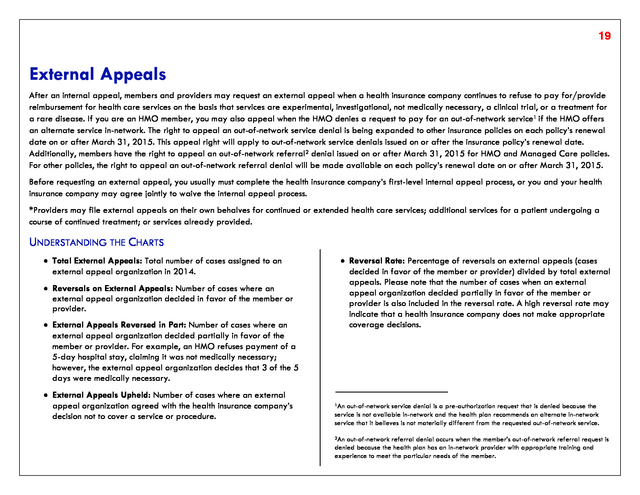 Please note that the number of cases when an external appeal organization decided partially in favor of the member or provider is also included in the reversal rate. 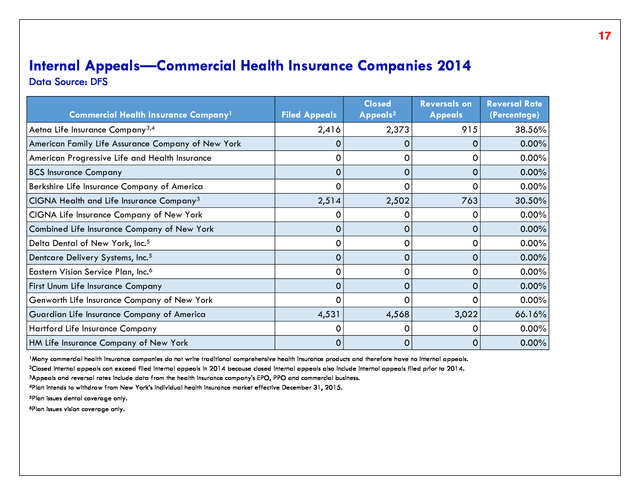 A high reversal rate may indicate that a health insurance company does not make appropriate coverage decisions. 1An out-of-network service denial is a pre-authorization request that is denied because the service is not available in-network and the health plan recommends an alternate in-network service that it believes is not materially different from the requested out-of-network service. 2An out-of-network referral denial occurs when the member&rsquo;s out-of-network referral request is denied because the health plan has an in-network provider with appropriate training and experience to meet the particular needs of the member. 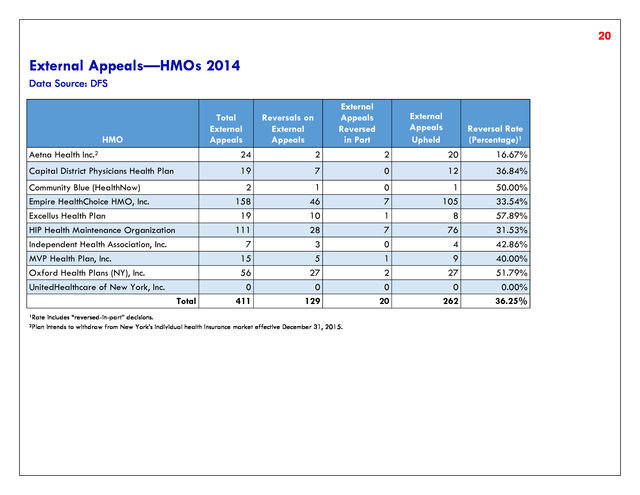 21) 20 External Appeals&mdash;HMOs 2014 Data Source: DFS Total External Appeals HMO Aetna Health Inc.2 External Appeals Reversed in Part Reversals on External Appeals External Appeals Upheld Reversal Rate (Percentage)1 24 2 2 20 16.67% Capital District Physicians Health Plan 19 7 0 12 36.84% Community Blue (HealthNow) Empire HealthChoice HMO, Inc. Excellus Health Plan HIP Health Maintenance Organization Independent Health Association, Inc. MVP Health Plan, Inc. Oxford Health Plans (NY), Inc. UnitedHealthcare of New York, Inc. 2 158 19 111 7 15 56 0 411 1 46 10 28 3 5 27 0 129 0 7 1 7 0 1 2 0 20 1 105 8 76 4 9 27 0 262 50.00% 33.54% 57.89% 31.53% 42.86% 40.00% 51.79% 0.00% 36.25% Total 1Rate 2Plan includes &ldquo;reversed-in-part&rdquo; decisions. 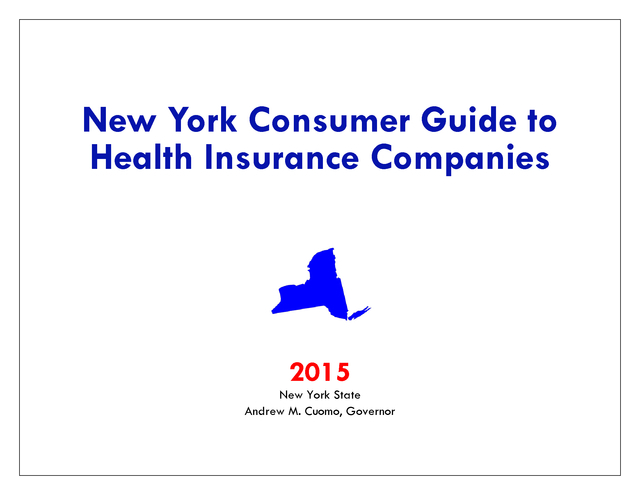 intends to withdraw from New York&rsquo;s individual health insurance market effective December 31, 2015. 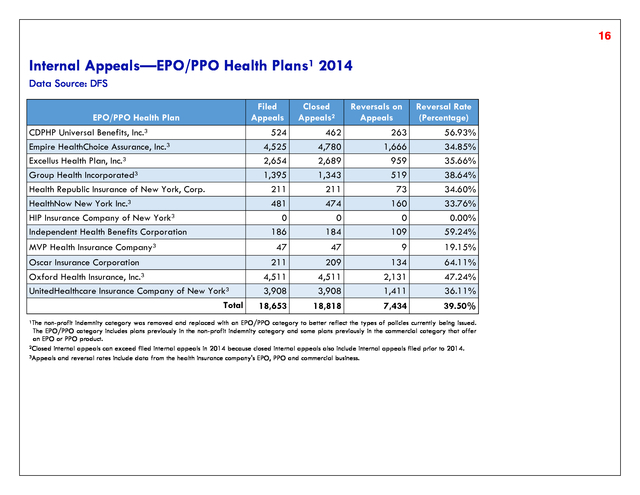 22) 21 External Appeals&mdash;EPO/PPO Health Plans1 2014 Data Source: DFS External Appeals External Appeals Reversal Rate Total External Reversals on Reversed Appeals External Appeals in Part Upheld (Percentage)2 EPO/PPO Health Plan 9 2 0 7 22.22% Empire HealthChoice Assurance, Inc.3 547 196 18 333 39.12% Excellus Health Plan, Inc. 3 105 44 2 59 43.81% Group Health Incorporated3 136 46 12 78 42.65% 2 1 0 1 50.00% 46 16 2 28 39.13% HIP Insurance Company of New York3 6 4 0 2 66.67% Independent Health Benefits Corporation 9 3 1 5 44.44% 16 8 3 5 68.75% 8 3 0 5 37.50% 164 64 6 94 42.68% 29 10 4 15 48.28% 1,077 397 48 632 41.32% CDPHP Universal Benefits, Inc.3 Health Republic Insurance of New York, Corp. HealthNow New York Inc.3 MVP Health Insurance Company3 Oscar Insurance Corporation Oxford Health Insurance, Inc.3 UnitedHealthcare Insurance Company of New York3 Total 1The non-profit indemnity category was removed and replaced with an EPO/PPO category to better reflect the types of policies currently being issued. The EPO/PPO category includes plans previously in the non-profit indemnity category and some plans previously in the commercial category that offer an EPO or PPO product. 2Rate includes &ldquo;reversed-in-part&rdquo; decisions. 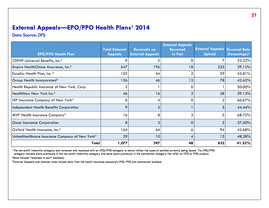 3External Appeals and reversal rates include data from the health insurance company's EPO, PPO and commercial business. 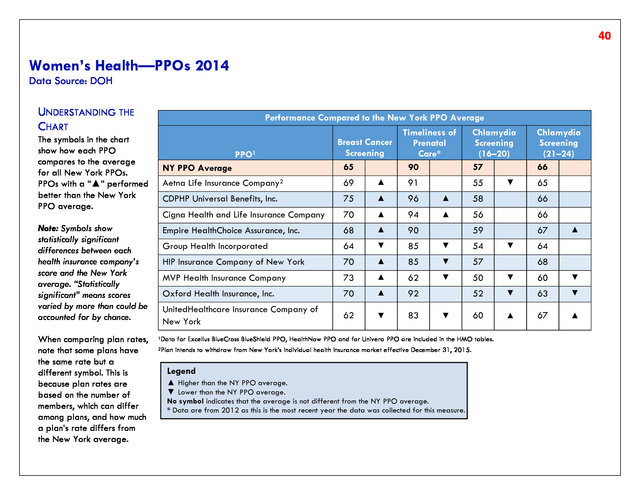 27) 26 Grievances&mdash; EPO/PPO Health Plans1 2014 Data Source: DFS Filed Grievances EPO/PPO Health Plan Closed Grievances2 Reversed Grievances Grievances Upheld Reversal Rate (Percentage) CDPHP Universal Benefits, Inc.3 0 0 0 0 0.00% Empire HealthChoice Assurance, Inc.3 0 0 0 0 0.00% Excellus Health Plan, Inc.3 1,734 1,802 835 967 46.34% Group Health Incorporated3 1,709 1,772 443 1,329 25.00% Health Republic Insurance of New York, Corp. 6,801 4,554 2,405 2,149 52.81% HealthNow New York Inc.3 0 0 0 0 0.00% HIP Insurance Company of New York3 0 0 0 0 0.00% 173 175 82 93 46.86% MVP Health Insurance Company3 50 50 13 37 26.00% Oscar Insurance Corporation 99 94 94 0 100.00% 4,850 4,856 1,321 3,535 27.20% 0 0 0 0 0.00% 15,416 13,303 5,193 8,110 39.04% Independent Health Benefits Corporation Oxford Health Insurance, Inc.3 UnitedHealthcare Insurance Company of New York3 Total 1The non-profit indemnity category was removed and replaced with an EPO/PPO category to better reflect the types of policies currently being issued. The EPO/PPO category includes plans previously in the non-profit indemnity category and some plans previously in the commercial category that offer an EPO or PPO product. 2Closed grievances can exceed filed grievances in 2014 because closed grievances also include grievances filed prior to 2014. 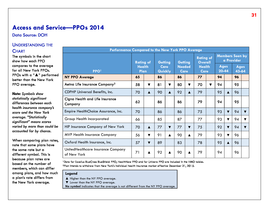 3Grievances and reversal rates include data from the health insurance company's EPO, PPO and commercial business. 29) 28 Grievances&mdash;Commercial Health Insurance Companies 2014 Data Source: DFS Filed Grievances 0 0 0 Reversal Rate (Percentage) 0 0.00% Massachusetts Mutual Life Insurance Company 0 0 0 0 0.00% Metropolitan Life Insurance Company 0 0 0 0 0.00% 10 10 4 6 40.00% National Union Fire Insurance Company of Pittsburgh, PA 0 0 0 0 0.00% New York Life Insurance Company 0 0 0 0 0.00% Nippon Life Insurance Company of America 0 0 0 0 0.00% Northwestern Mutual Life Insurance Company 0 0 0 0 0.00% Paul Revere Life Insurance Company 0 0 0 0 0.00% Principal Life Insurance Company 0 0 0 0 0.00% Prudential Insurance Company of America 0 0 0 0 0.00% ShelterPoint Life Insurance Company 0 0 0 0 0.00% Standard Life Insurance Company of New York 0 0 0 0 0.00% Standard Security Life Insurance Company of New York 0 0 0 0 0.00% Sun Life and Health Insurance Company 0 0 0 0 0.00% Transamerica Financial Life Insurance Company 0 0 0 0 0.00% United States Fire Insurance Company 0 0 0 0 0.00% 4,501 4,116 1,247 2,869 30.30% Commercial Health Insurance Company1 Lincoln Life &amp; Annuity Company of New York MVP Health Services Corporation2 Total 1Many 2Plan Closed Grievances Reversed Grievances Grievances Upheld commercial health insurance companies do not write traditional comprehensive health insurance products and therefore have no grievances. issues dental coverage only. 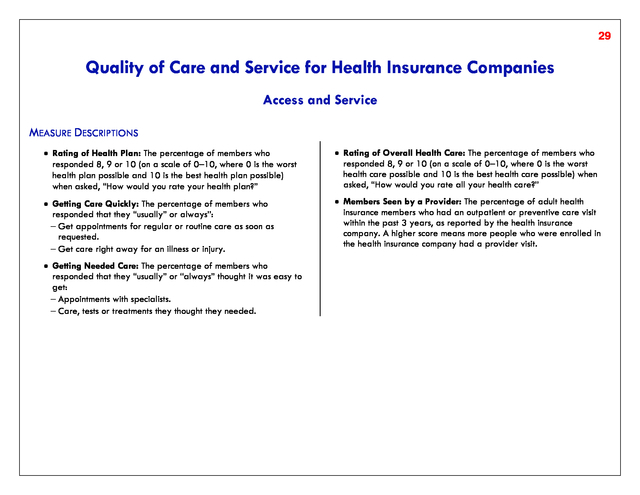 30) 29 Quality of Care and Service for Health Insurance Companies Access and Service MEASURE DESCRIPTIONS ï‚· Rating of Health Plan: The percentage of members who responded 8, 9 or 10 (on a scale of 0&ndash;10, where 0 is the worst health plan possible and 10 is the best health plan possible) when asked, &ldquo;How would you rate your health plan?&rdquo; ï‚· Rating of Overall Health Care: The percentage of members who responded 8, 9 or 10 (on a scale of 0&ndash;10, where 0 is the worst health care possible and 10 is the best health care possible) when asked, &ldquo;How would you rate all your health care?&rdquo; ï‚· Getting Care Quickly: The percentage of members who responded that they &ldquo;usually&rdquo; or always&rdquo;: &ndash; Get appointments for regular or routine care as soon as requested. &ndash; Get care right away for an illness or injury. ï‚· Members Seen by a Provider: The percentage of adult health insurance members who had an outpatient or preventive care visit within the past 3 years, as reported by the health insurance company. 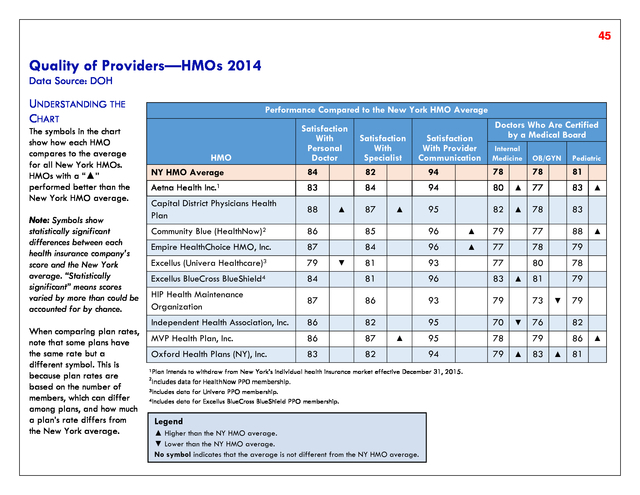 A higher score means more people who were enrolled in the health insurance company had a provider visit. ï‚· Getting Needed Care: The percentage of members who responded that they &ldquo;usually&rdquo; or &ldquo;always&rdquo; thought it was easy to get: &ndash; Appointments with specialists. &ndash; Care, tests or treatments they thought they needed. 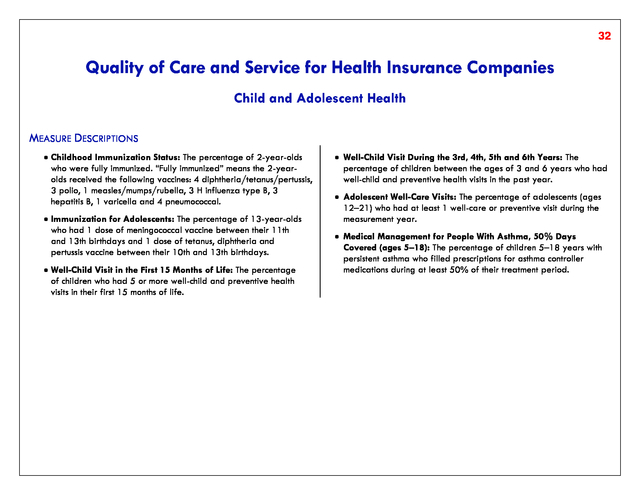 33) 32 Quality of Care and Service for Health Insurance Companies Child and Adolescent Health MEASURE DESCRIPTIONS ï‚· Childhood Immunization Status: The percentage of 2-year-olds who were fully immunized. &ldquo;Fully immunized&rdquo; means the 2-yearolds received the following vaccines: 4 diphtheria/tetanus/pertussis, 3 polio, 1 measles/mumps/rubella, 3 H influenza type B, 3 hepatitis B, 1 varicella and 4 pneumococcal. ï‚· Immunization for Adolescents: The percentage of 13-year-olds who had 1 dose of meningococcal vaccine between their 11th and 13th birthdays and 1 dose of tetanus, diphtheria and pertussis vaccine between their 10th and 13th birthdays. ï‚· Well-Child Visit in the First 15 Months of Life: The percentage of children who had 5 or more well-child and preventive health visits in their first 15 months of life. ï‚· Well-Child Visit During the 3rd, 4th, 5th and 6th Years: The percentage of children between the ages of 3 and 6 years who had well-child and preventive health visits in the past year. ï‚· Adolescent Well-Care Visits: The percentage of adolescents (ages 12&ndash;21) who had at least 1 well-care or preventive visit during the measurement year. ï‚· Medical Management for People With Asthma, 50% Days Covered (ages 5&ndash;18): The percentage of children 5&ndash;18 years with persistent asthma who filled prescriptions for asthma controller medications during at least 50% of their treatment period. 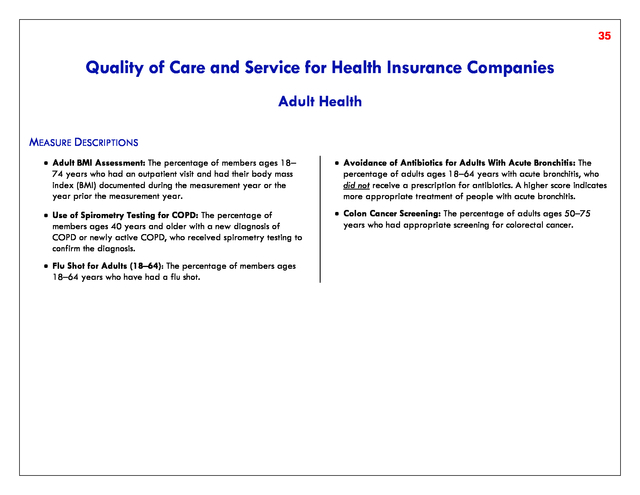 36) 35 Quality of Care and Service for Health Insurance Companies Adult Health MEASURE DESCRIPTIONS ï‚· Adult BMI Assessment: The percentage of members ages 18&ndash; 74 years who had an outpatient visit and had their body mass index (BMI) documented during the measurement year or the year prior the measurement year. ï‚· Avoidance of Antibiotics for Adults With Acute Bronchitis: The percentage of adults ages 18&ndash;64 years with acute bronchitis, who did not receive a prescription for antibiotics. A higher score indicates more appropriate treatment of people with acute bronchitis. ï‚· Use of Spirometry Testing for COPD: The percentage of members ages 40 years and older with a new diagnosis of COPD or newly active COPD, who received spirometry testing to confirm the diagnosis. ï‚· Colon Cancer Screening: The percentage of adults ages 50&ndash;75 years who had appropriate screening for colorectal cancer. ï‚· Flu Shot for Adults (18&ndash;64): The percentage of members ages 18&ndash;64 years who have had a flu shot. 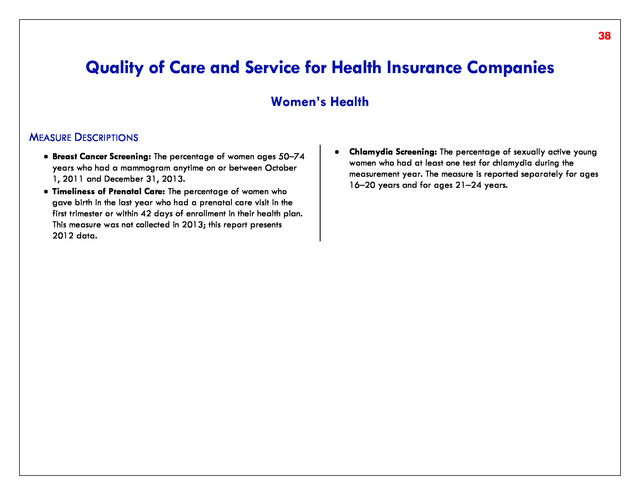 39) 38 Quality of Care and Service for Health Insurance Companies Women&rsquo;s Health MEASURE DESCRIPTIONS ï‚· Breast Cancer Screening: The percentage of women ages 50&ndash;74 years who had a mammogram anytime on or between October 1, 2011 and December 31, 2013. ï‚· Timeliness of Prenatal Care: The percentage of women who gave birth in the last year who had a prenatal care visit in the first trimester or within 42 days of enrollment in their health plan. 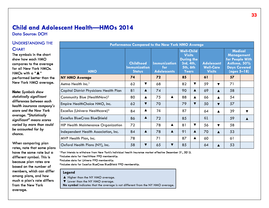 This measure was not collected in 2013; this report presents 2012 data. ï‚· Chlamydia Screening: The percentage of sexually active young women who had at least one test for chlamydia during the measurement year. The measure is reported separately for ages 16&ndash;20 years and for ages 21&ndash;24 years. 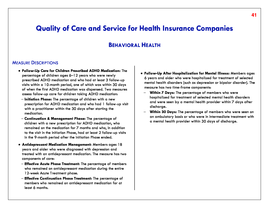 42) 41 Quality of Care and Service for Health Insurance Companies BEHAVIORAL HEALTH MEASURE DESCRIPTIONS ï‚· Follow-Up Care for Children Prescribed ADHD Medication: The percentage of children ages 6&ndash;12 years who were newly prescribed ADHD medication and who had at least 3 follow-up visits within a 10-month period, one of which was within 30 days of when the first ADHD medication was dispensed. Two measures assess follow-up care for children taking ADHD medication: &ndash; Initiation Phase: The percentage of children with a new prescription for ADHD medication and who had 1 follow-up visit with a practitioner within the 30 days after starting the medication. &ndash; Continuation &amp; Management Phase: The percentage of children with a new prescription for ADHD medication, who remained on the medication for 7 months and who, in addition to the visit in the Initiation Phase, had at least 2 follow-up visits in the 9-month period after the Initiation Phase ended. 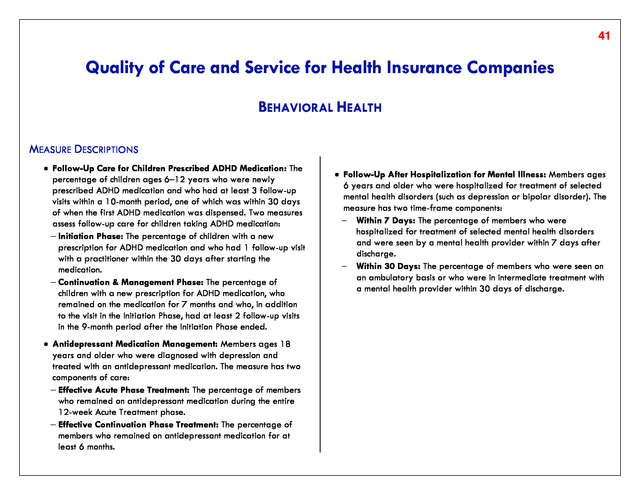 ï‚· Antidepressant Medication Management: Members ages 18 years and older who were diagnosed with depression and treated with an antidepressant medication. The measure has two components of care: &ndash; Effective Acute Phase Treatment: The percentage of members who remained on antidepressant medication during the entire 12-week Acute Treatment phase. &ndash; Effective Continuation Phase Treatment: The percentage of members who remained on antidepressant medication for at least 6 months. ï‚· Follow-Up After Hospitalization for Mental Illness: Members ages 6 years and older who were hospitalized for treatment of selected mental health disorders (such as depression or bipolar disorder). The measure has two time-frame components: &ndash; Within 7 Days: The percentage of members who were hospitalized for treatment of selected mental health disorders and were seen by a mental health provider within 7 days after discharge. &ndash; Within 30 Days: The percentage of members who were seen on an ambulatory basis or who were in intermediate treatment with a mental health provider within 30 days of discharge. 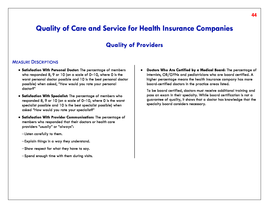 45) 44 Quality of Care and Service for Health Insurance Companies Quality of Providers MEASURE DESCRIPTIONS ï‚· Satisfaction With Personal Doctor: The percentage of members who responded 8, 9 or 10 (on a scale of 0&ndash;10, where 0 is the worst personal doctor possible and 10 is the best personal doctor possible) when asked, &ldquo;How would you rate your personal doctor?&rdquo; ï‚· Satisfaction With Specialist: The percentage of members who responded 8, 9 or 10 (on a scale of 0&ndash;10, where 0 is the worst specialist possible and 10 is the best specialist possible) when asked &ldquo;How would you rate your specialist?&rdquo; ï‚· Satisfaction With Provider Communication: The percentage of members who responded that their doctors or health care providers &ldquo;usually&rdquo; or &ldquo;always&rdquo;: &ndash; Listen carefully to them. &ndash; Explain things in a way they understand. &ndash; Show respect for what they have to say. &ndash; Spend enough time with them during visits. ï‚· Doctors Who Are Certified by a Medical Board: The percentage of internists, OB/GYNs and pediatricians who are board certified. A higher percentage means the health insurance company has more board-certified doctors in the practice areas listed. To be board certified, doctors must receive additional training and pass an exam in their specialty. While board certification is not a guarantee of quality, it shows that a doctor has knowledge that the specialty board considers necessary. 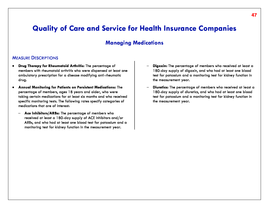 48) 47 Quality of Care and Service for Health Insurance Companies Managing Medications MEASURE DESCRIPTIONS ï‚· Drug Therapy for Rheumatoid Arthritis: The percentage of members with rheumatoid arthritis who were dispensed at least one ambulatory prescription for a disease modifying anti-rheumatic drug. &ndash; Digoxin: The percentage of members who received at least a 180-day supply of digoxin, and who had at least one blood test for potassium and a monitoring test for kidney function in the measurement year. ï‚· Annual Monitoring for Patients on Persistent Medications: The percentage of members, ages 18 years and older, who were taking certain medications for at least six months and who received specific monitoring tests. The following rates specify categories of medications that are of interest: &ndash; Diuretics: The percentage of members who received at least a 180-day supply of diuretics, and who had at least one blood test for potassium and a monitoring test for kidney function in the measurement year. &ndash; Ace Inhibitors/ARBs: The percentage of members who received at least a 180-day supply of ACE inhibitors and/or ARBs, and who had at least one blood test for potassium and a monitoring test for kidney function in the measurement year. 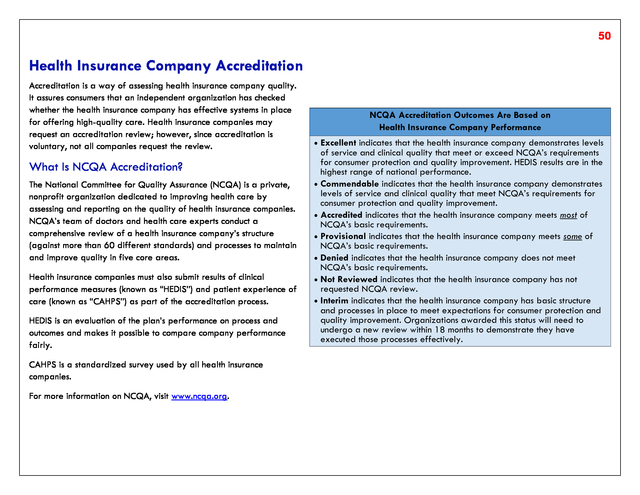 52) 51 NCQA Accreditation Status as of July 20151 NCQA Accreditation Status as of July 20151 HMO Accreditation Status Aetna Health Inc. 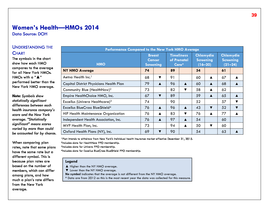 Commendable Capital District Physicians Health Plan Excellent Community Blue (HealthNow) Excellent Empire HealthChoice HMO, Inc. 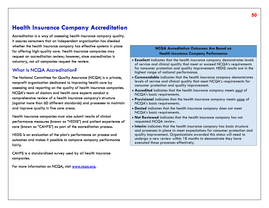 Commendable Excellus Health Plan Commendable HIP Health Maintenance Organization Commendable Independent Health Association, Inc. 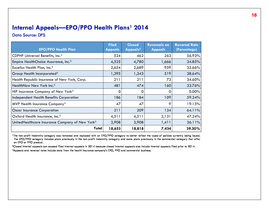 Excellent MVP Health Plan, Inc. 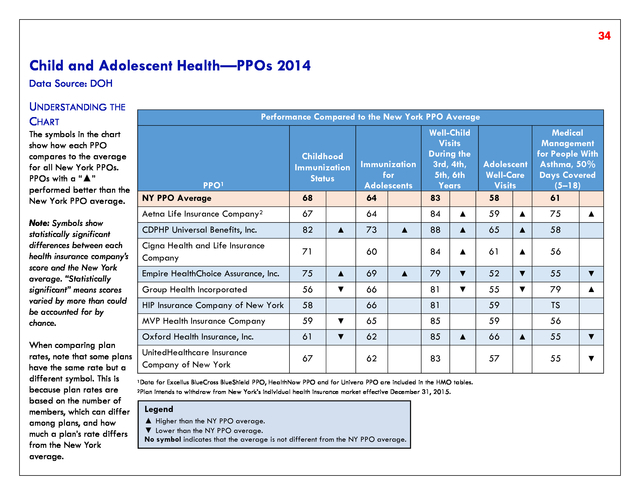 Excellent Oxford Health Plans (NY), Inc. 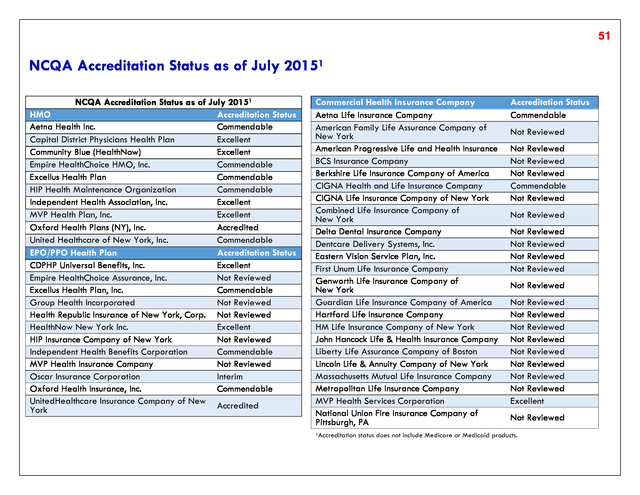 Accredited United Healthcare of New York, Inc. 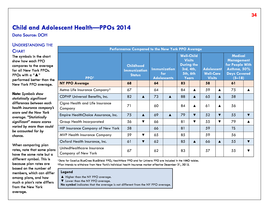 Commendable EPO/PPO Health Plan Accreditation Status CDPHP Universal Benefits, Inc. 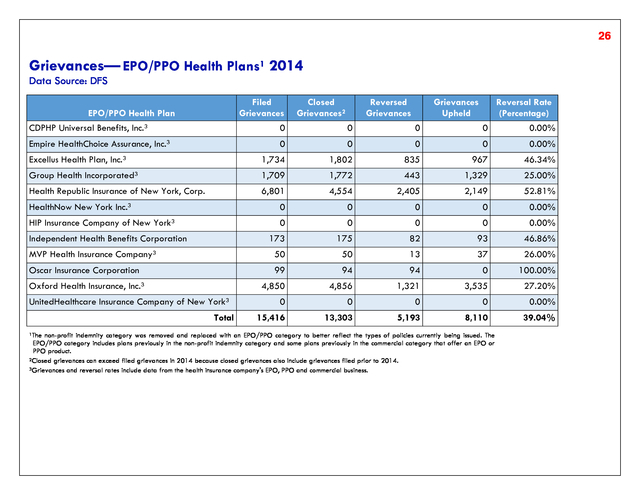 Excellent Empire HealthChoice Assurance, Inc. Not Reviewed Excellus Health Plan, Inc. 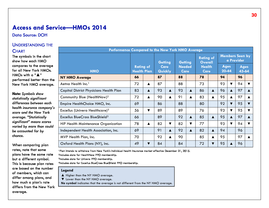 Commendable Group Health Incorporated Not Reviewed Health Republic Insurance of New York, Corp. Not Reviewed HealthNow New York Inc. 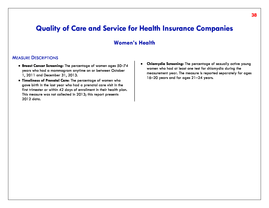 Excellent HIP Insurance Company of New York Not Reviewed Independent Health Benefits Corporation Commendable MVP Health Insurance Company Not Reviewed Oscar Insurance Corporation Interim Oxford Health Insurance, Inc. 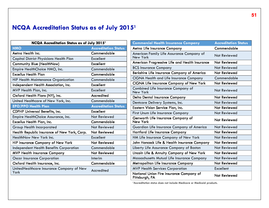 Commendable UnitedHealthcare Insurance Company of New Accredited York Commercial Health Insurance Company Aetna Life Insurance Company American Family Life Assurance Company of New York American Progressive Life and Health Insurance BCS Insurance Company Berkshire Life Insurance Company of America CIGNA Health and Life Insurance Company CIGNA Life Insurance Company of New York Combined Life Insurance Company of New York Delta Dental Insurance Company Dentcare Delivery Systems, Inc. Eastern Vision Service Plan, Inc. First Unum Life Insurance Company Genworth Life Insurance Company of New York Guardian Life Insurance Company of America Hartford Life Insurance Company HM Life Insurance Company of New York John Hancock Life &amp; Health Insurance Company Liberty Life Assurance Company of Boston Lincoln Life &amp; Annuity Company of New York Massachusetts Mutual Life Insurance Company Metropolitan Life Insurance Company MVP Health Services Corporation National Union Fire Insurance Company of Pittsburgh, PA 1Accreditation Accreditation Status Commendable Not Reviewed Not Reviewed Not Reviewed Not Reviewed Commendable Not Reviewed Not Reviewed Not Reviewed Not Reviewed Not Reviewed Not Reviewed Not Reviewed Not Reviewed Not Reviewed Not Reviewed Not Reviewed Not Reviewed Not Reviewed Not Reviewed Not Reviewed Excellent Not Reviewed status does not include Medicare or Medicaid products. 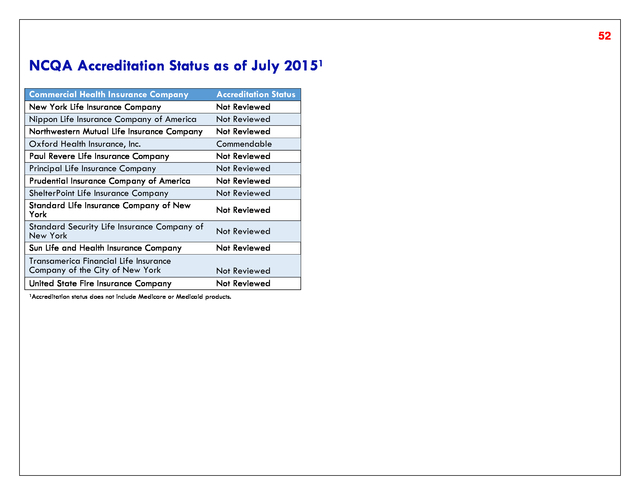 53) 52 NCQA Accreditation Status as of July 20151 Commercial Health Insurance Company New York Life Insurance Company Nippon Life Insurance Company of America Northwestern Mutual Life Insurance Company Oxford Health Insurance, Inc. Paul Revere Life Insurance Company Principal Life Insurance Company Prudential Insurance Company of America ShelterPoint Life Insurance Company Standard Life Insurance Company of New York Standard Security Life Insurance Company of New York Sun Life and Health Insurance Company Transamerica Financial Life Insurance Company of the City of New York United State Fire Insurance Company 1Accreditation Accreditation Status Not Reviewed Not Reviewed Not Reviewed Commendable Not Reviewed Not Reviewed Not Reviewed Not Reviewed Not Reviewed Not Reviewed Not Reviewed Not Reviewed Not Reviewed status does not include Medicare or Medicaid products. 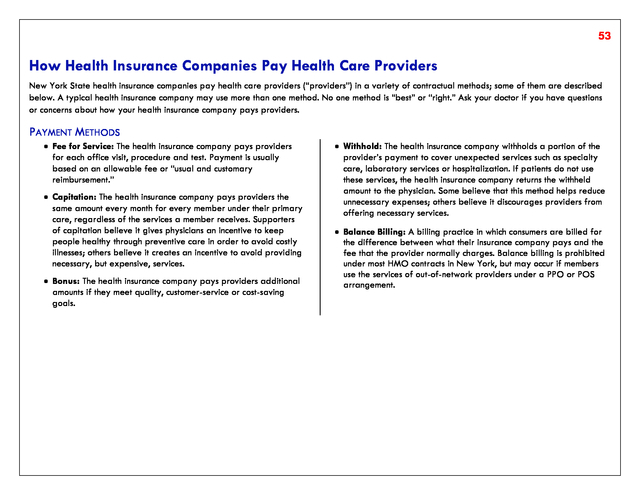 54) 53 How Health Insurance Companies Pay Health Care Providers New York State health insurance companies pay health care providers (&ldquo;providers&rdquo;) in a variety of contractual methods; some of them are described below. 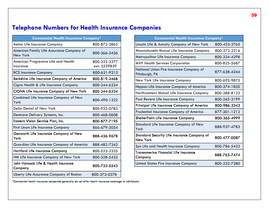 A typical health insurance company may use more than one method. No one method is &ldquo;best&rdquo; or &ldquo;right.&rdquo; Ask your doctor if you have questions or concerns about how your health insurance company pays providers. PAYMENT METHODS ï‚· Fee for Service: The health insurance company pays providers for each office visit, procedure and test. Payment is usually based on an allowable fee or &ldquo;usual and customary reimbursement.&rdquo; ï‚· Capitation: The health insurance company pays providers the same amount every month for every member under their primary care, regardless of the services a member receives. Supporters of capitation believe it gives physicians an incentive to keep people healthy through preventive care in order to avoid costly illnesses; others believe it creates an incentive to avoid providing necessary, but expensive, services. 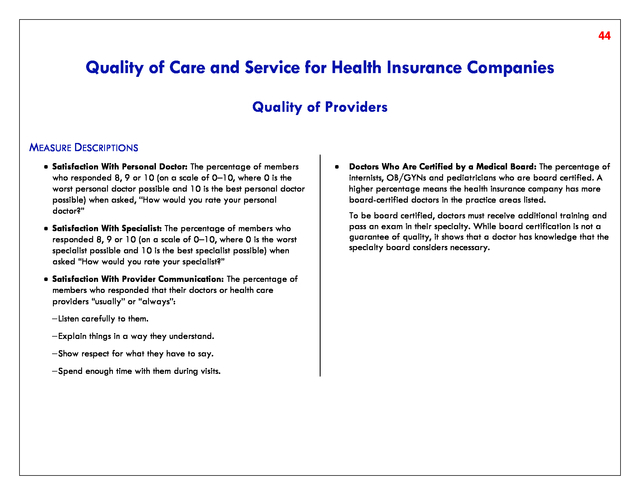 ï‚· Bonus: The health insurance company pays providers additional amounts if they meet quality, customer-service or cost-saving goals. ï‚· Withhold: The health insurance company withholds a portion of the provider&rsquo;s payment to cover unexpected services such as specialty care, laboratory services or hospitalization. 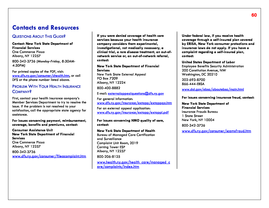 If patients do not use these services, the health insurance company returns the withheld amount to the physician. Some believe that this method helps reduce unnecessary expenses; others believe it discourages providers from offering necessary services. 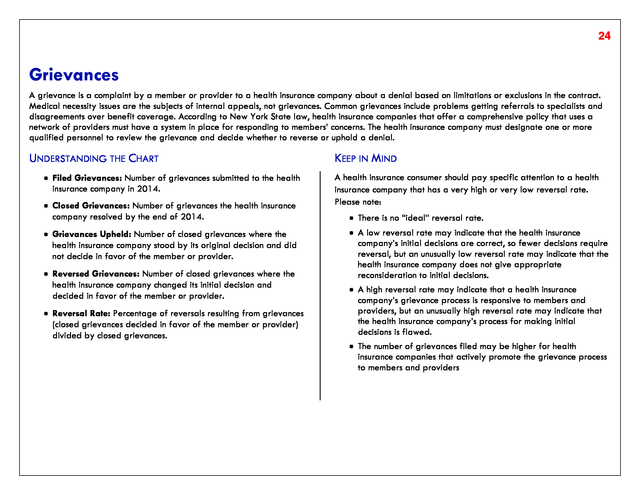 ï‚· Balance Billing: A billing practice in which consumers are billed for the difference between what their insurance company pays and the fee that the provider normally charges. Balance billing is prohibited under most HMO contracts in New York, but may occur if members use the services of out-of-network providers under a PPO or POS arrangement. 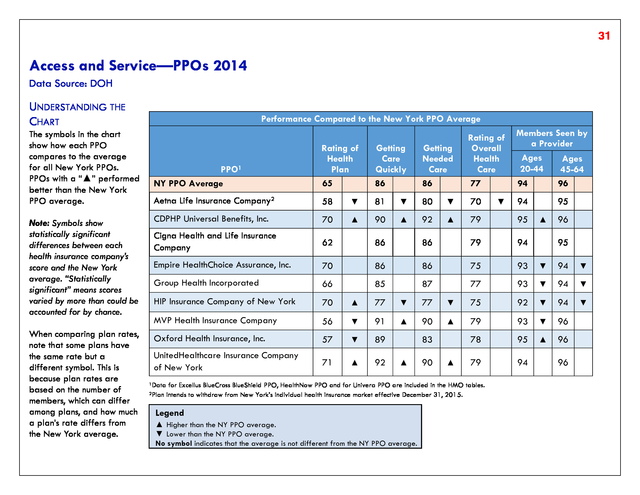 55) 54 Overall Complaint Ranking Each year, DFS receives complaints about health insurance companies from consumers and health care providers. 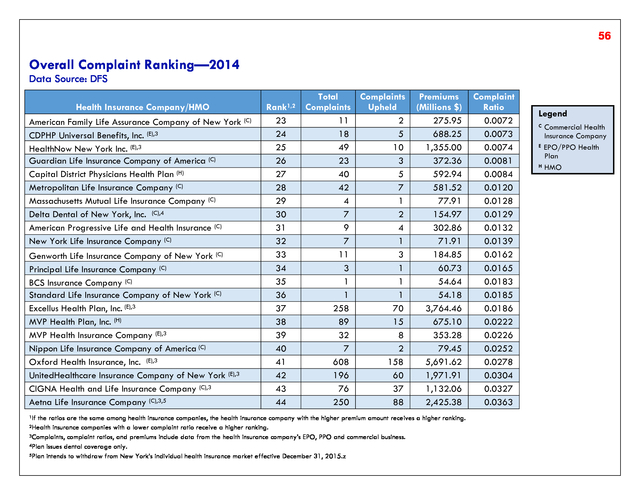 After reviewing each complaint, DFS determines if the health insurance company acted appropriately. If DFS determines that the health insurance company did not act in accordance with its statutory and contractual obligations, the health insurance company must resolve the problem to come into compliance. 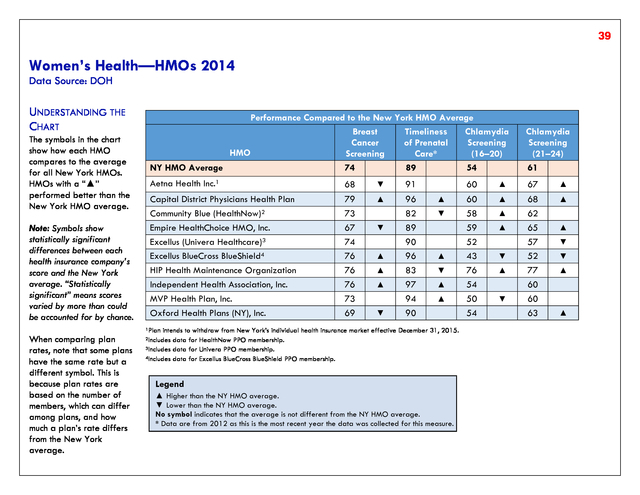 The overall rank of all New York State insurance companies (HMOs, EPO/PPO health plans and commercial health insurance companies) is based on complaints closed by DFS. 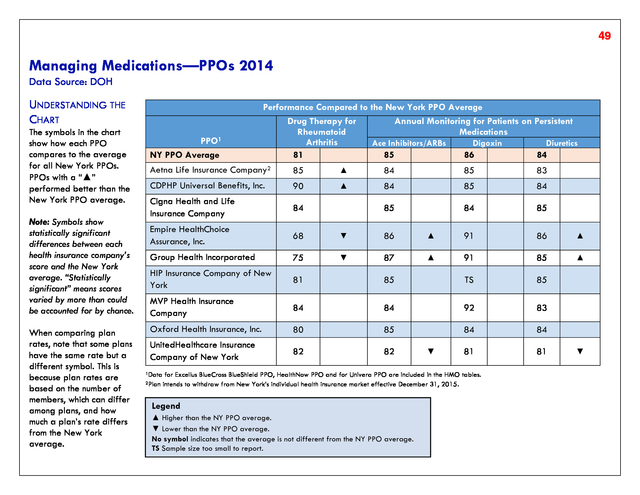 It is not possible to compare different types of health insurance companies on a standardized basis. Consumers should consider a health insurance company&rsquo;s ranking in its category, as well as its overall ranking. 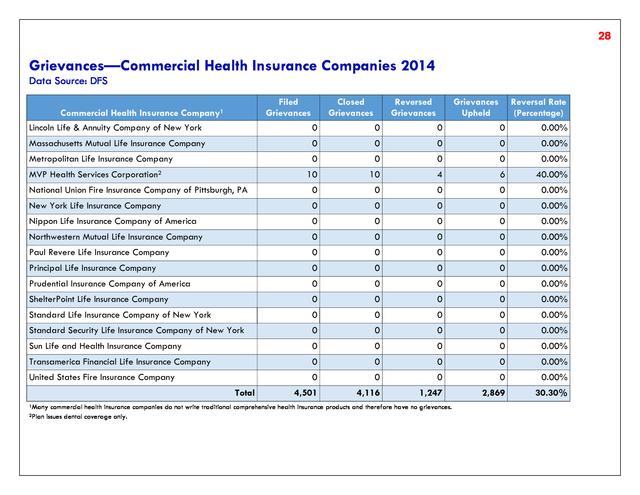 UNDERSTANDING THE CHARTS ï‚· Rank: Each health insurance company&rsquo;s ranking is based on how many complaints were resolved by DFS in favor of the member or provider, relative to the company&rsquo;s premiums. A lower number results in a higher ranking. 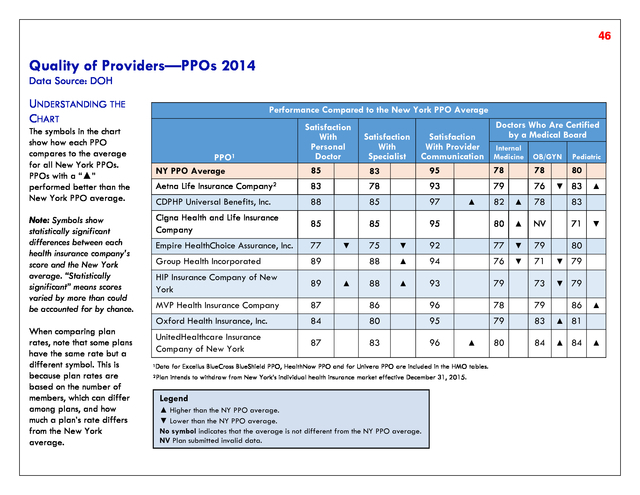 If the ratios are the same, the health insurance company with the higher premiums is ranked higher. ï‚· Premiums: Dollar amount generated by a health insurance company in New York State during 2014. Premiums are used to calculate the complaint ratio so that health insurance companies of different sizes can be compared fairly. Premium data exclude Medicare and Medicaid. ï‚· Total Complaints: Total number of complaints closed by DFS in 2014. 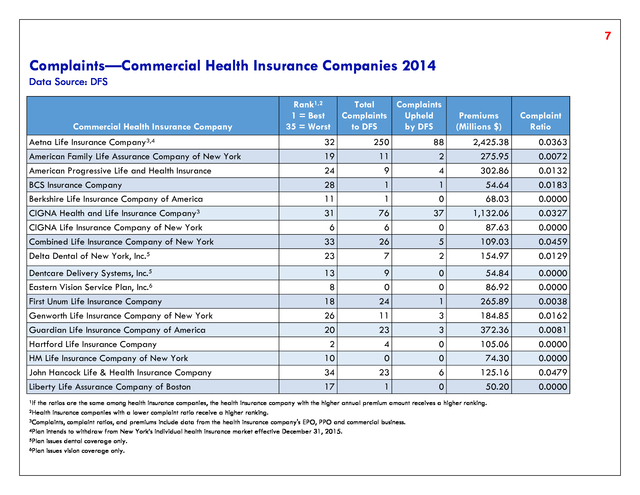 Large health insurance companies may receive more complaints because they have more consumers than smaller health insurance companies. 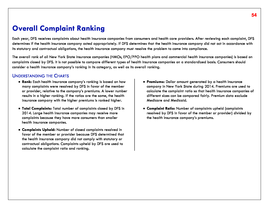 ï‚· Complaint Ratio: Number of complaints upheld (complaints resolved by DFS in favor of the member or provider) divided by the health insurance company&rsquo;s premiums. 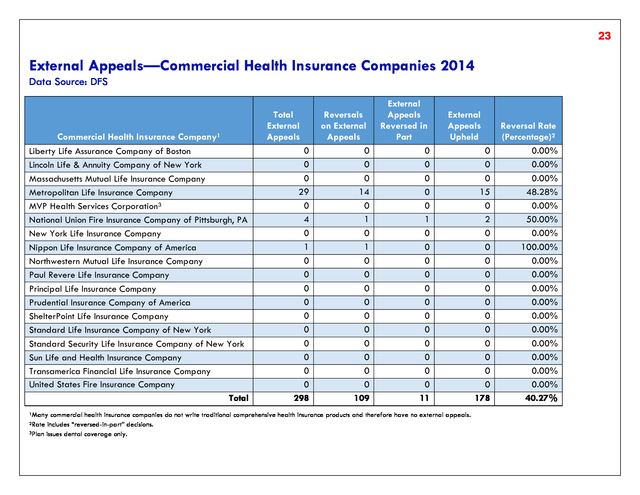 ï‚· Complaints Upheld: Number of closed complaints resolved in favor of the member or provider because DFS determined that the health insurance company did not comply with statutory or contractual obligations. Complaints upheld by DFS are used to calculate the complaint ratio and ranking. 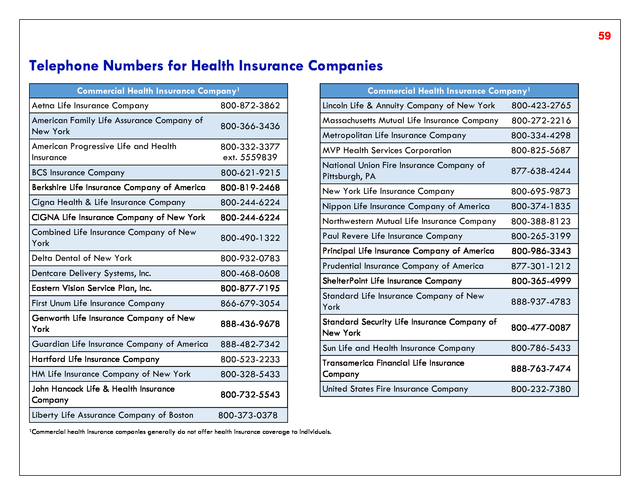 60) 59 Telephone Numbers for Health Insurance Companies Commercial Health Insurance Company1 Aetna Life Insurance Company 800-872-3862 Commercial Health Insurance Company1 Lincoln Life &amp; Annuity Company of New York 800-423-2765 American Family Life Assurance Company of New York 800-366-3436 Massachusetts Mutual Life Insurance Company 800-272-2216 Metropolitan Life Insurance Company 800-334-4298 American Progressive Life and Health Insurance 800-332-3377 ext. 5559839 MVP Health Services Corporation 800-825-5687 BCS Insurance Company 800-621-9215 National Union Fire Insurance Company of Pittsburgh, PA 877-638-4244 Berkshire Life Insurance Company of America 800-819-2468 New York Life Insurance Company 800-695-9873 Cigna Health &amp; Life Insurance Company 800-244-6224 Nippon Life Insurance Company of America 800-374-1835 CIGNA Life Insurance Company of New York 800-244-6224 Northwestern Mutual Life Insurance Company 800-388-8123 Combined Life Insurance Company of New York 800-490-1322 Paul Revere Life Insurance Company 800-265-3199 Delta Dental of New York 800-932-0783 Principal Life Insurance Company of America 800-986-3343 Dentcare Delivery Systems, Inc. 800-468-0608 Prudential Insurance Company of America 877-301-1212 Eastern Vision Service Plan, Inc. 800-877-7195 ShelterPoint Life Insurance Company 800-365-4999 First Unum Life Insurance Company 866-679-3054 Standard Life Insurance Company of New York 888-937-4783 Genworth Life Insurance Company of New York 888-436-9678 Standard Security Life Insurance Company of New York 800-477-0087 Guardian Life Insurance Company of America 888-482-7342 Sun Life and Health Insurance Company 800-786-5433 Hartford Life Insurance Company 800-523-2233 HM Life Insurance Company of New York 800-328-5433 Transamerica Financial Life Insurance Company 888-763-7474 John Hancock Life &amp; Health Insurance Company 800-732-5543 United States Fire Insurance Company 800-232-7380 Liberty Life Assurance Company of Boston 800-373-0378 1Commercial health insurance companies generally do not offer health insurance coverage to individuals. 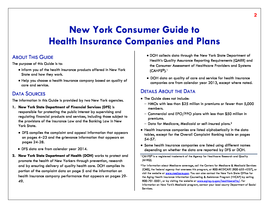 62) 61 Contacts and Resources INFORMATION ABOUT NY STATE OF HEALTH Under the Affordable Care Act, New York State operates a health benefits exchange called the New York State of Health (NYSOH). An exchange is an organized marketplace designed to help people shop for and enroll in health insurance coverage. 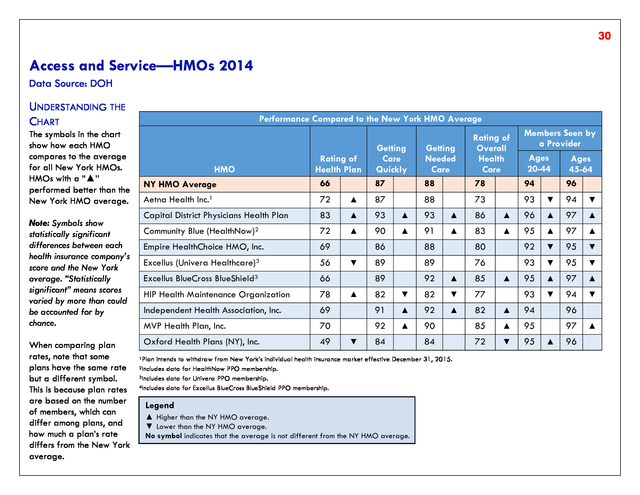 The NYSOH is an open and transparent marketplace where individuals and small businesses can compare rates, benefits and select the most appropriate health insurance plans. Federal tax credits may be available to help qualified consumers and small businesses pay for the coverage. 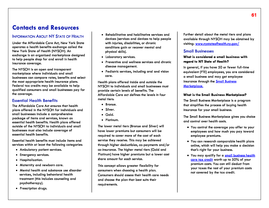 Essential Health Benefits The Affordable Care Act ensures that health plans offered in the NYSOH for individuals and small businesses include a comprehensive package of items and services, known as essential health benefits. 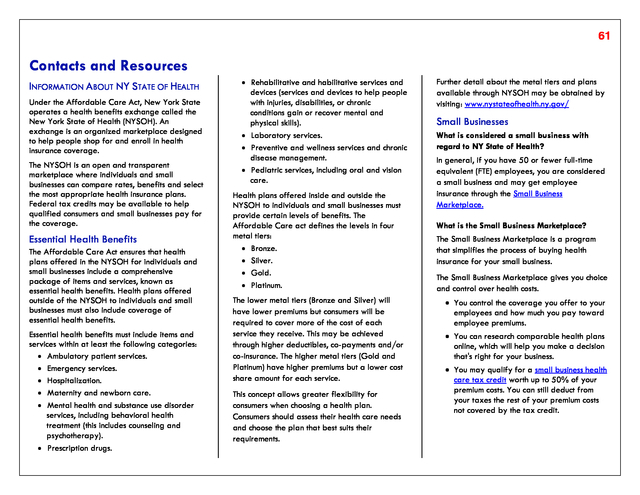 Health plans offered outside of the NYSOH to individuals and small businesses must also include coverage of essential health benefits. 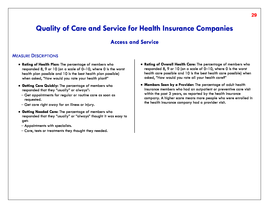 Essential health benefits must include items and services within at least the following categories: ï‚· Ambulatory patient services. ï‚· Emergency services. ï‚· Hospitalization. ï‚· Maternity and newborn care. ï‚· Mental health and substance use disorder services, including behavioral health treatment (this includes counseling and psychotherapy). ï‚· Prescription drugs. ï‚· Rehabilitative and habilitative services and devices (services and devices to help people with injuries, disabilities, or chronic conditions gain or recover mental and physical skills). ï‚· Laboratory services. ï‚· Preventive and wellness services and chronic disease management. ï‚· Pediatric services, including oral and vision care. 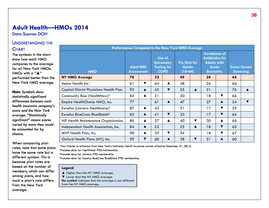 Health plans offered inside and outside the NYSOH to individuals and small businesses must provide certain levels of benefits. The Affordable Care act defines the levels in four metal tiers: ï‚· Bronze. ï‚· Silver. ï‚· Gold. ï‚· Platinum. The lower metal tiers (Bronze and Silver) will have lower premiums but consumers will be required to cover more of the cost of each service they receive. This may be achieved through higher deductibles, co-payments and/or co-insurance. The higher metal tiers (Gold and Platinum) have higher premiums but a lower cost share amount for each service. This concept allows greater flexibility for consumers when choosing a health plan. Consumers should assess their health care needs and choose the plan that best suits their requirements. 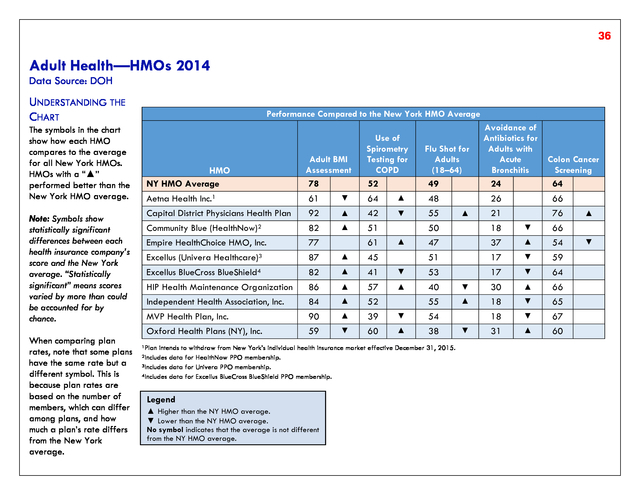 Further detail about the metal tiers and plans available through NYSOH may be obtained by visiting: www.nystateofhealth.ny.gov/ Small Businesses What is considered a small business with regard to NY State of Health? In general, if you have 50 or fewer full-time equivalent (FTE) employees, you are considered a small business and may get employee insurance through the Small Business Marketplace. What is the Small Business Marketplace? The Small Business Marketplace is a program that simplifies the process of buying health insurance for your small business. The Small Business Marketplace gives you choice and control over health costs. 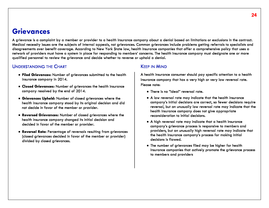 ï‚· You control the coverage you offer to your employees and how much you pay toward employee premiums. 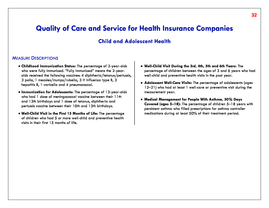 ï‚· You can research comparable health plans online, which will help you make a decision that's right for your business. 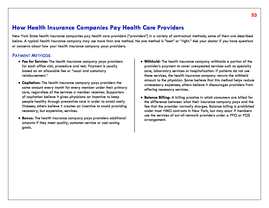 ï‚· You may qualify for a small business health care tax credit worth up to 50% of your premium costs. You can still deduct from your taxes the rest of your premium costs not covered by the tax credit.